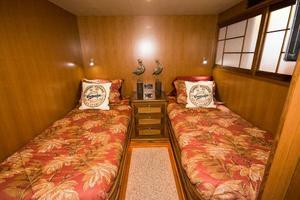 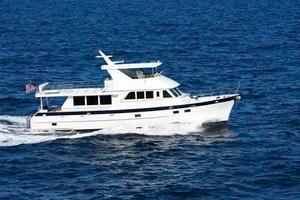 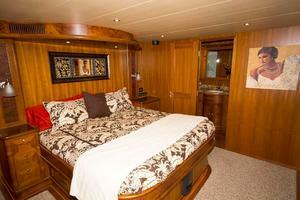 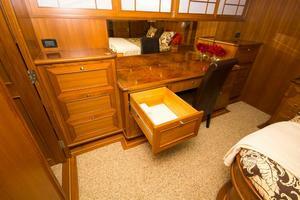 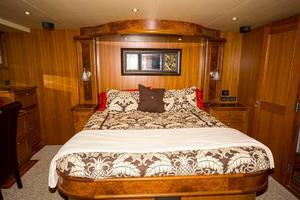 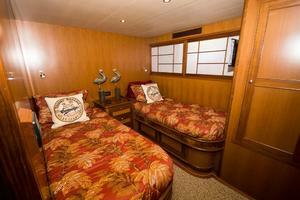 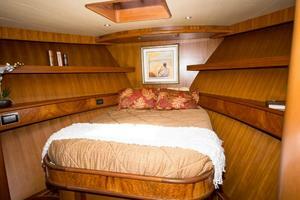 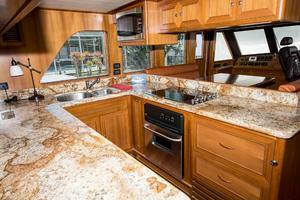 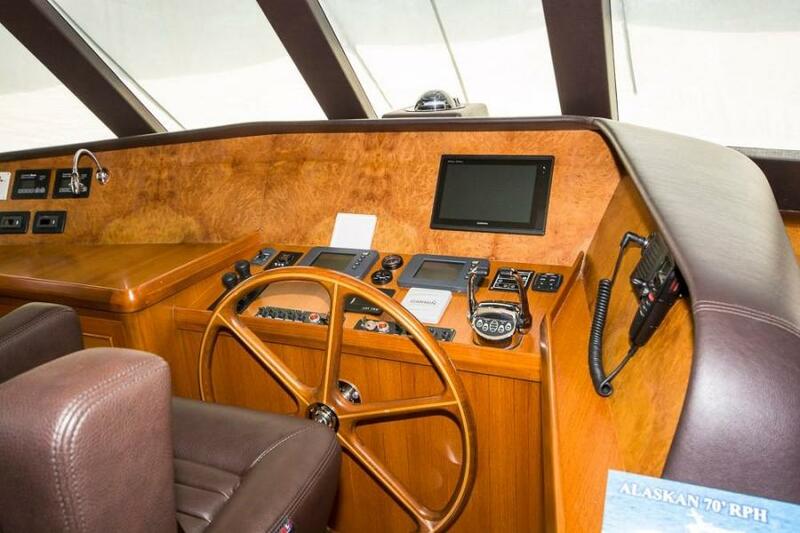 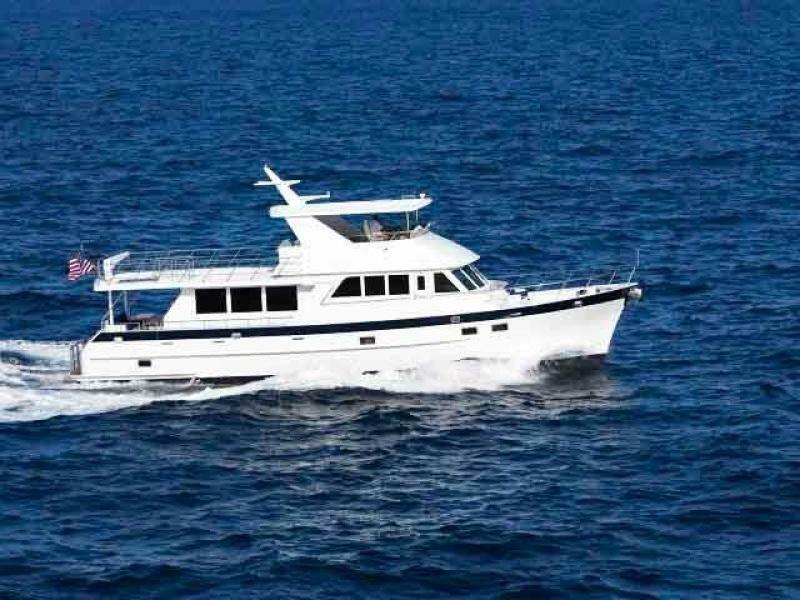 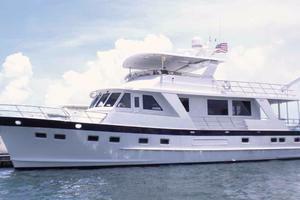 United Yacht Sales New Jersey would love to guide you through a personal showing of this 70' Alaskan 2012. 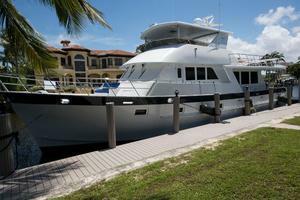 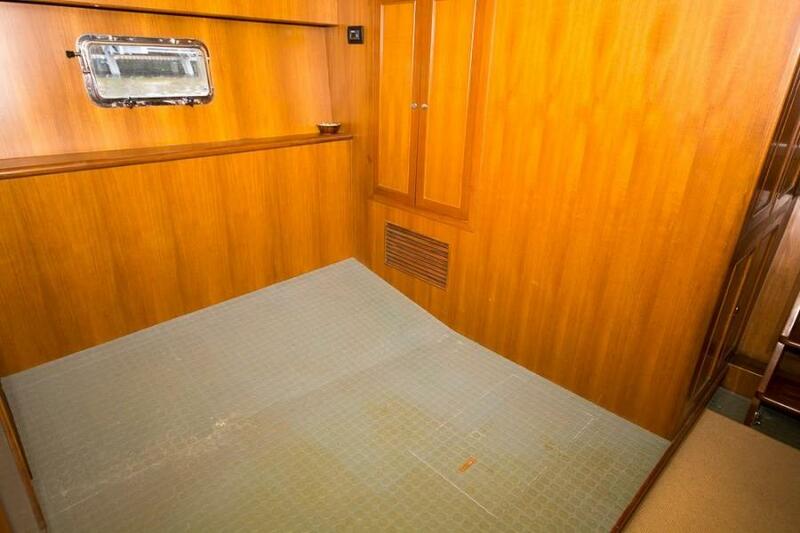 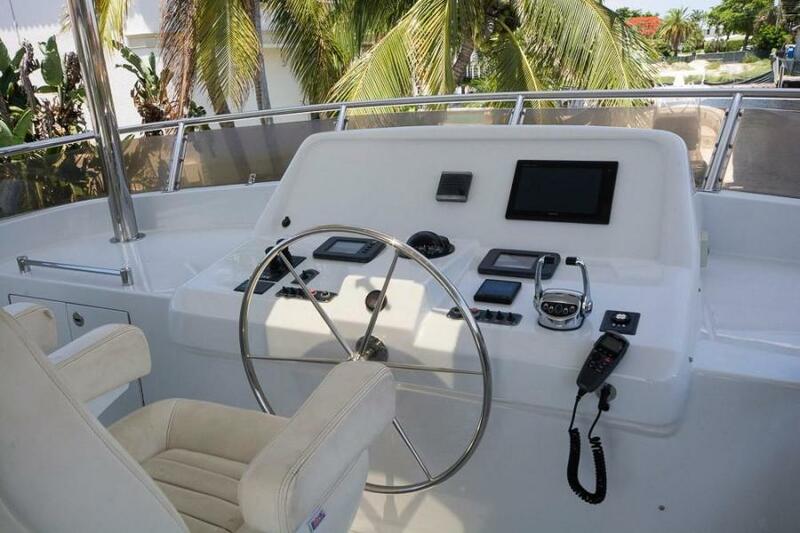 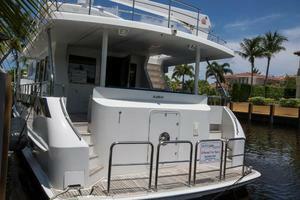 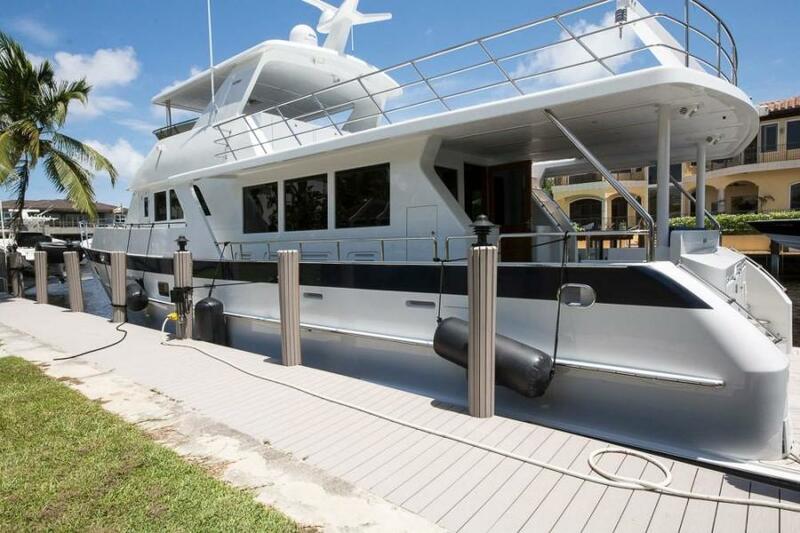 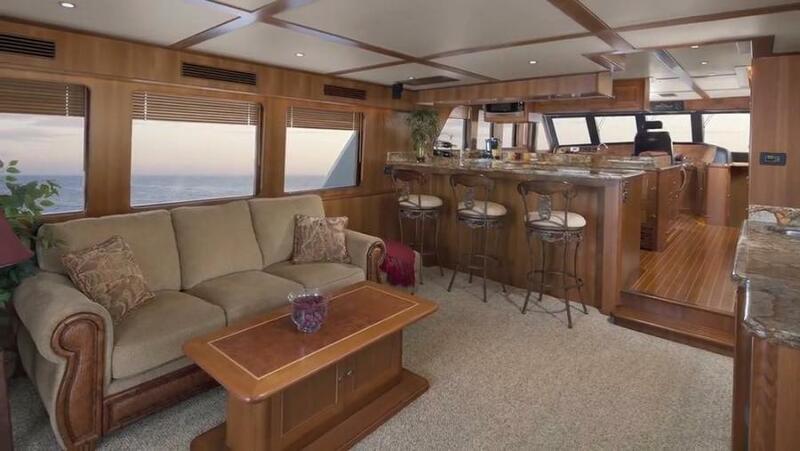 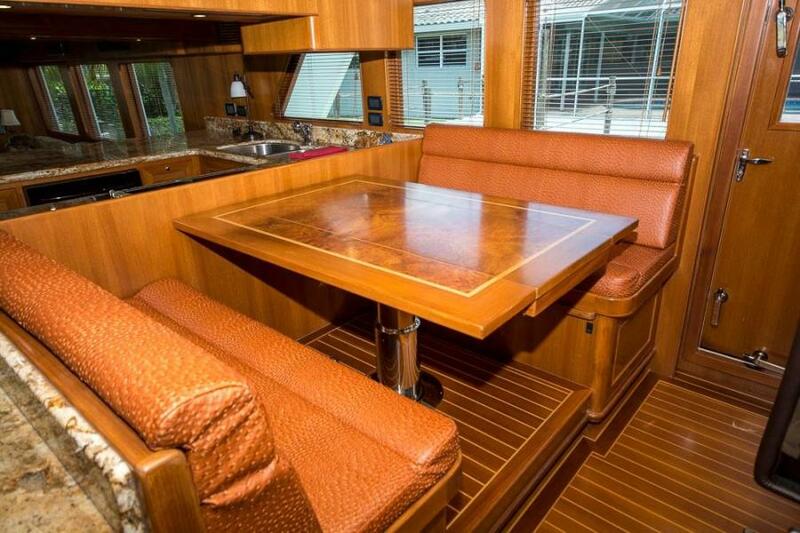 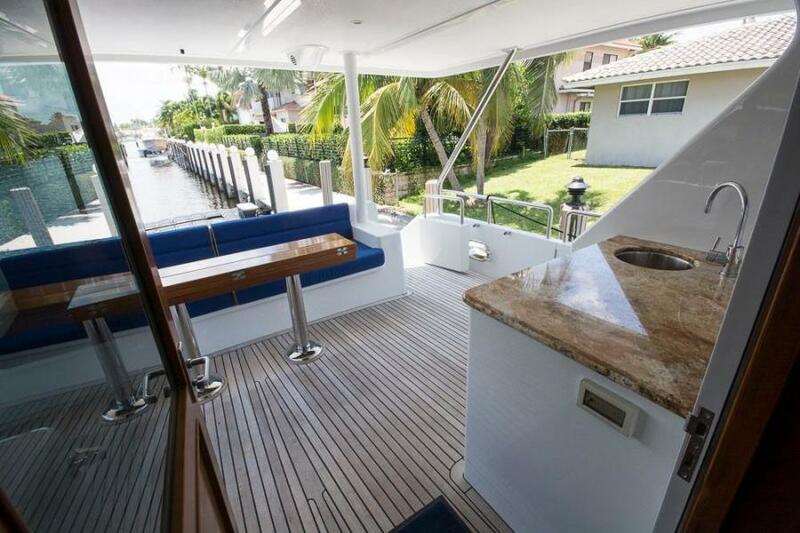 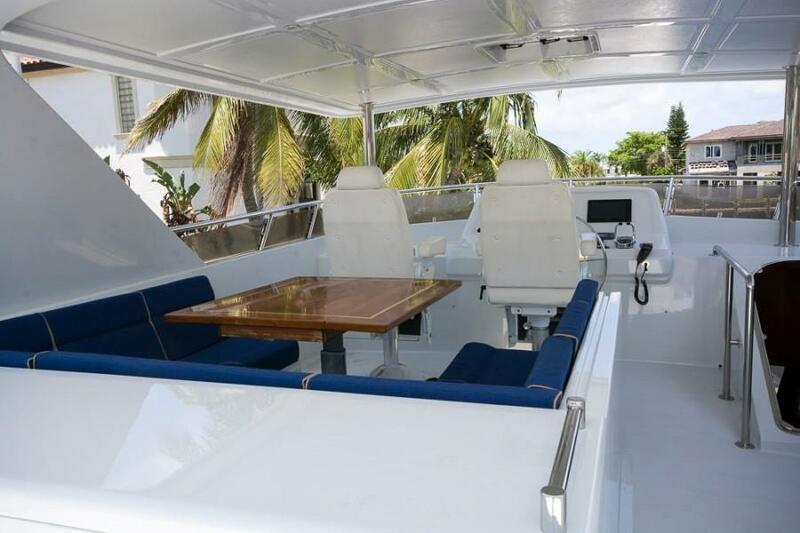 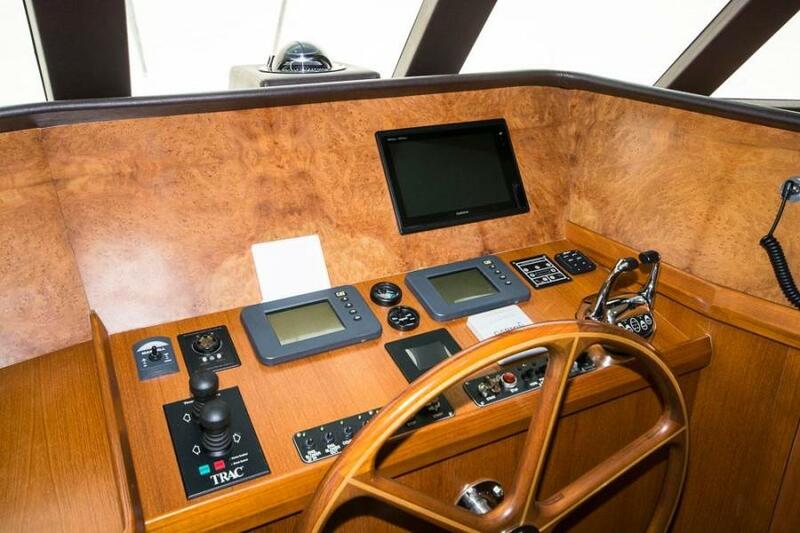 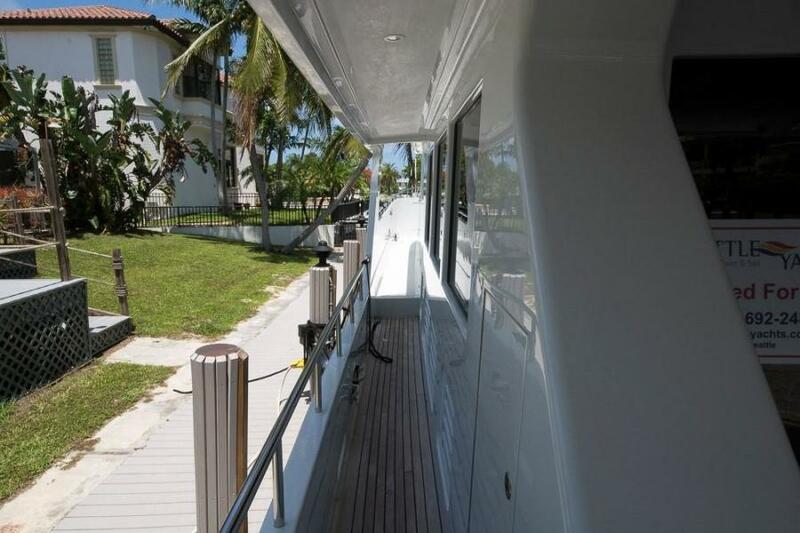 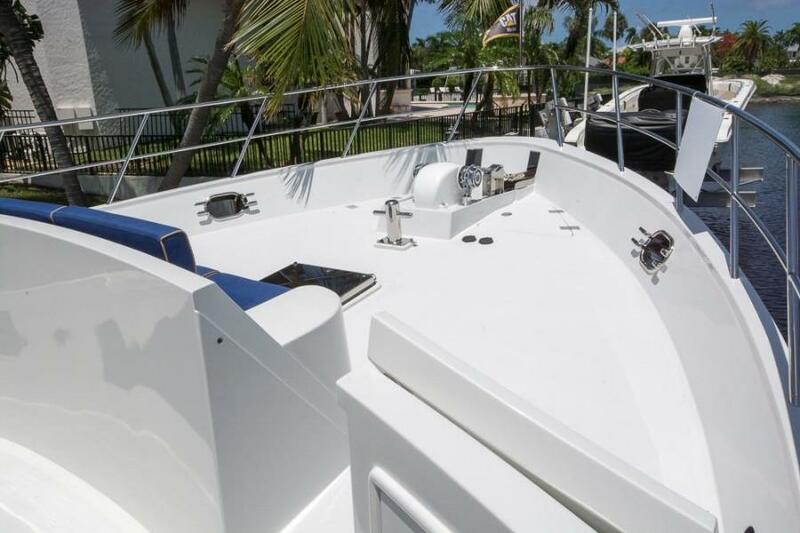 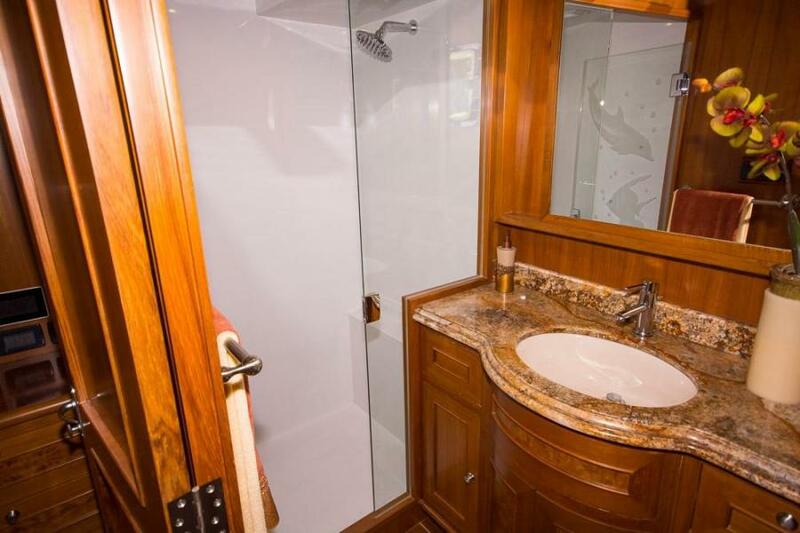 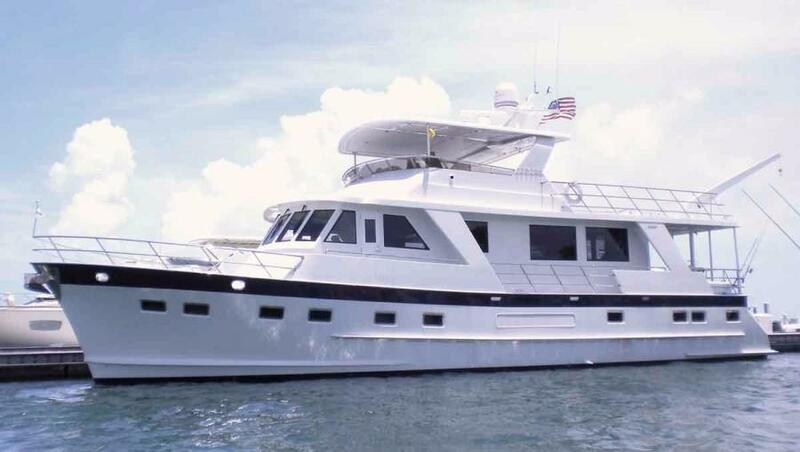 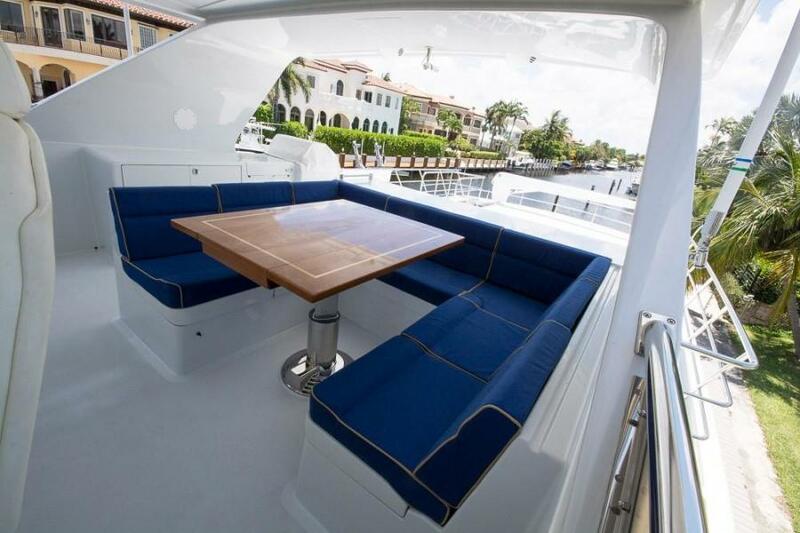 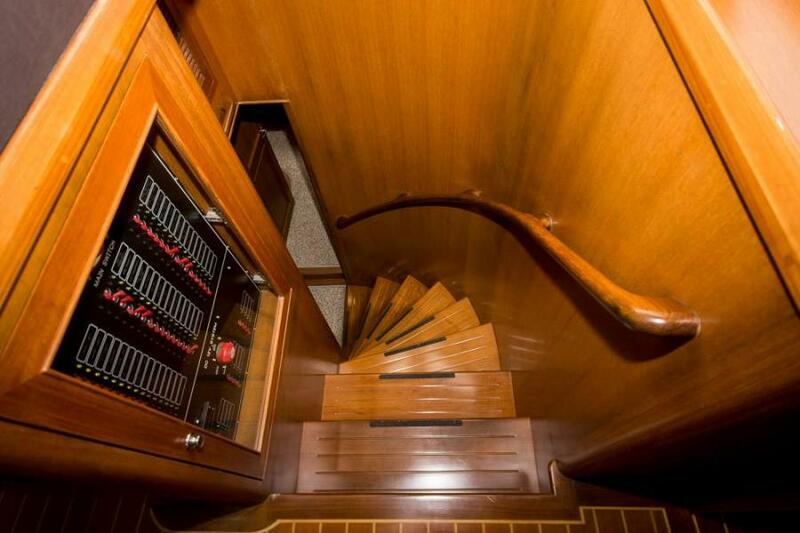 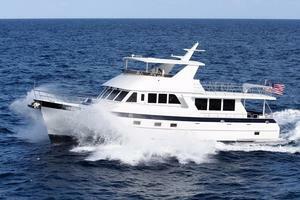 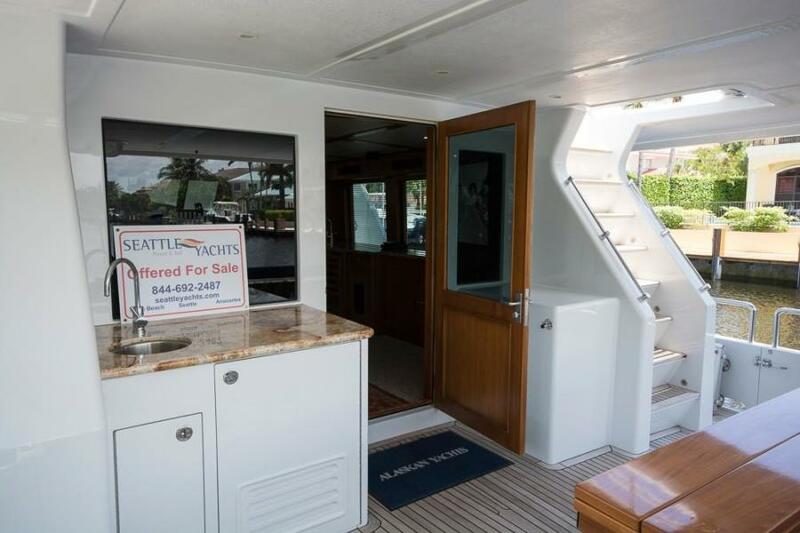 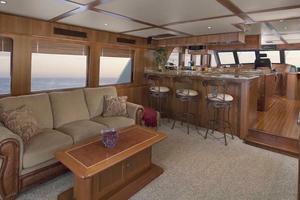 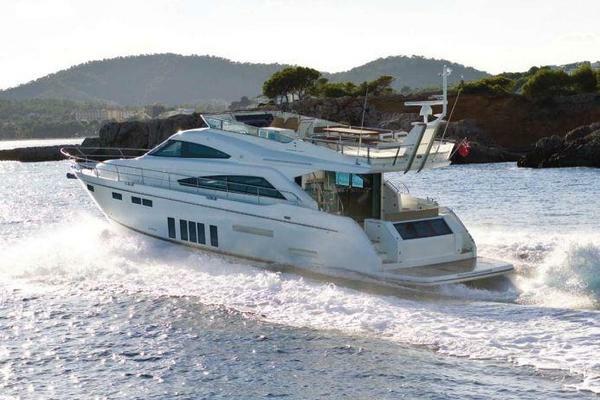 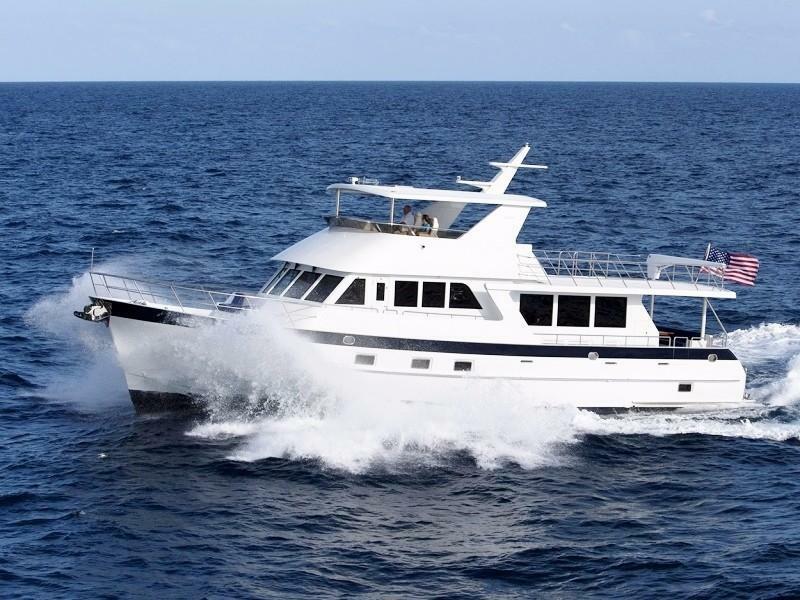 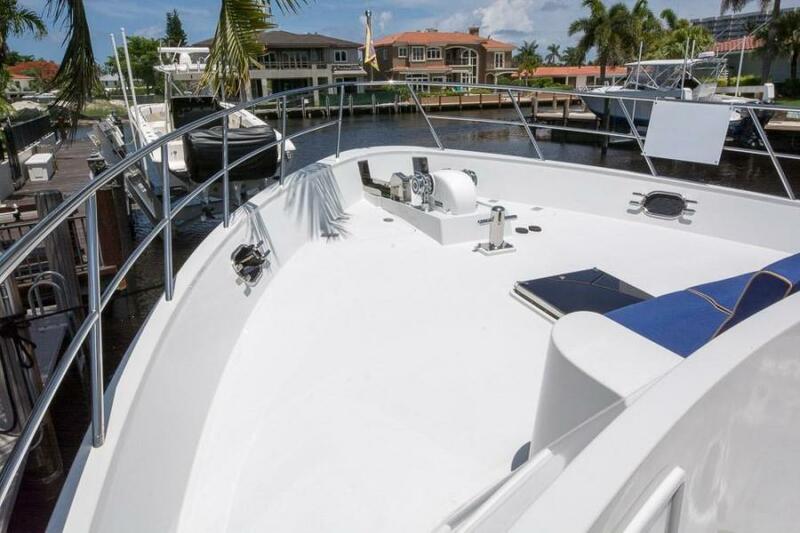 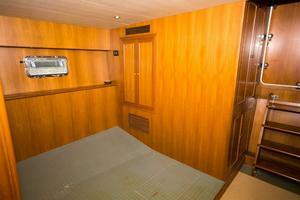 This yacht for sale is located in Lauderdale by the Sea, Florida and priced at $1,995,000. For a showing please contact us by filling out the form on this page and we will get back to you shortly! 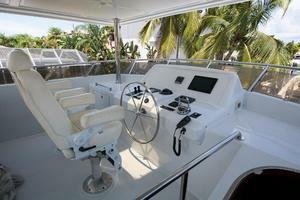 Hand Laid - Up FRP Deck/House And Flybridge W/Pvc/Balsa Foam Sandwich Construcion. Full Length Longitudinal Engine Stringers And Athwartship Stringers. 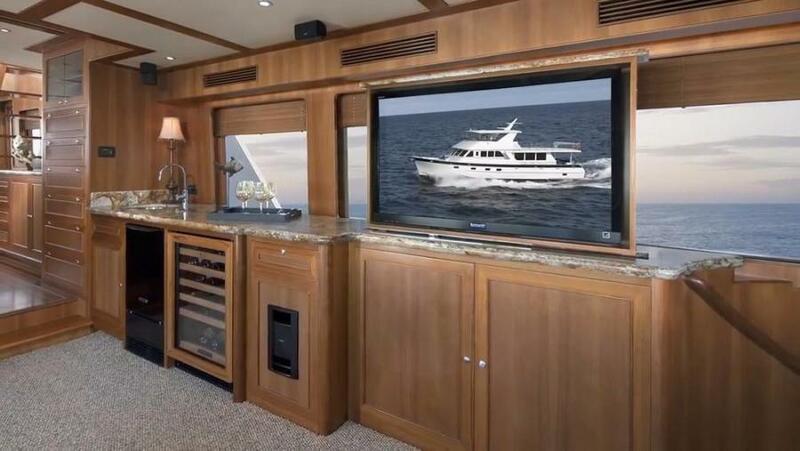 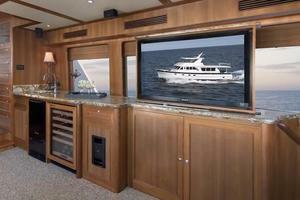 Windows With 3/8" Tempered Glass In Salon, 1/2" Tempered In Pilothouse. 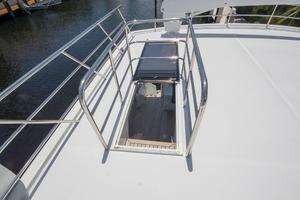 Rub Rails With Stainless Steel Capping. 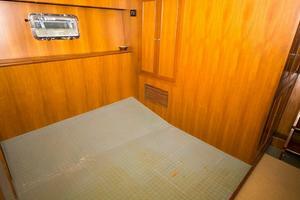 Bilge Area Finished Smooth And Coated With Epoxy Paint. 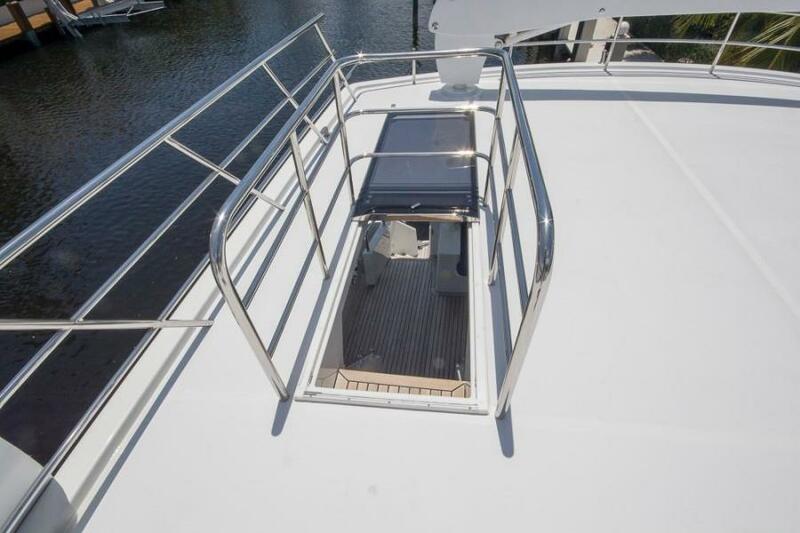 Built-In Swim Platform With Stainless Steel Swim Ladder And Rails. 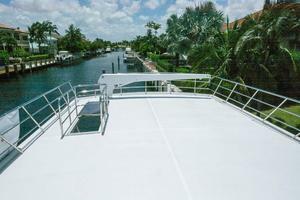 Gel Coated finish above water line. 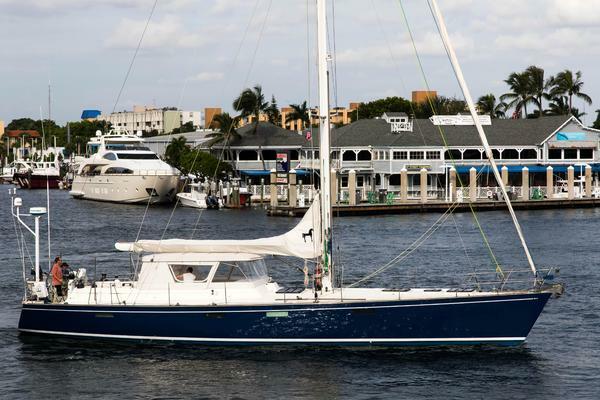 Keel Extends Full Length Below Running Gear Stainless Steel Rudders and Struts With Two (2) Prop Shafts. 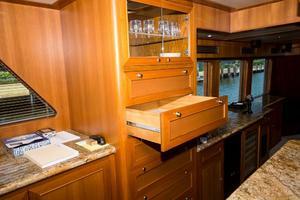 Deck and Hull Area Hardware Attachments are Finished with Solid Lamination - No Coring. 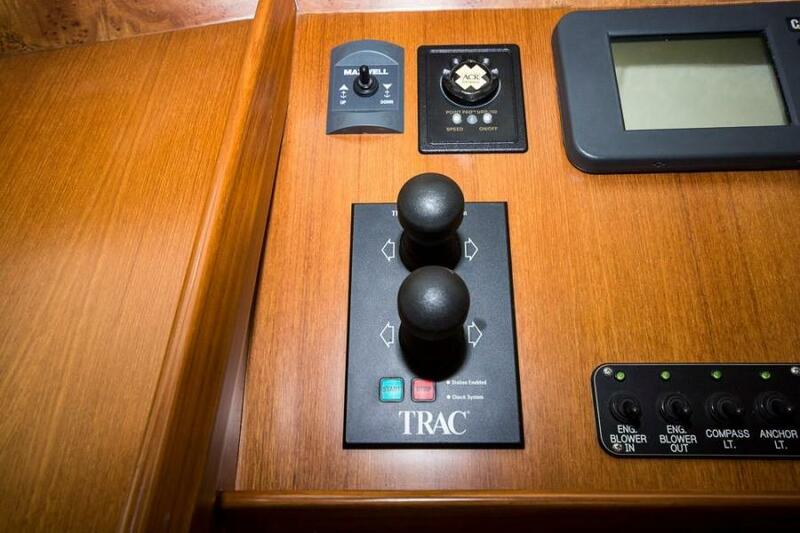 Large ABT Trac 7.5 Sq.Ft. 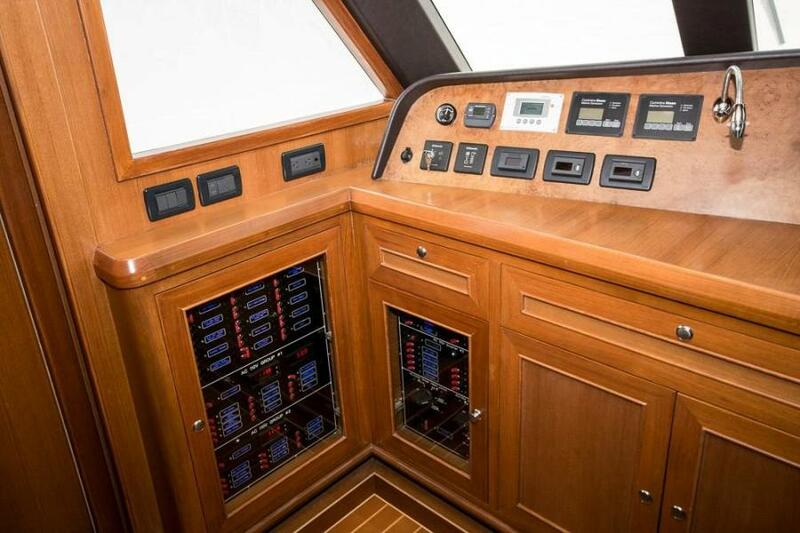 Fins and Dual Station Controls. Underwater Exhause System W/Frp Mufflers. 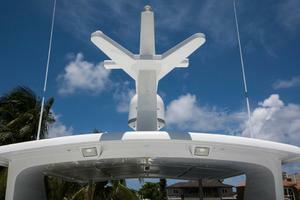 (2) Stainless Steel Propellor Shafts And (2) Bronze Propellers. 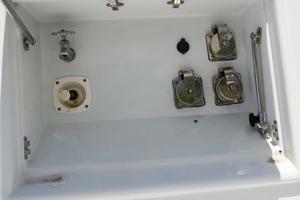 Dripless Props / Rudders Shaft Seals. Oil Drip Enclosure Under Engines. 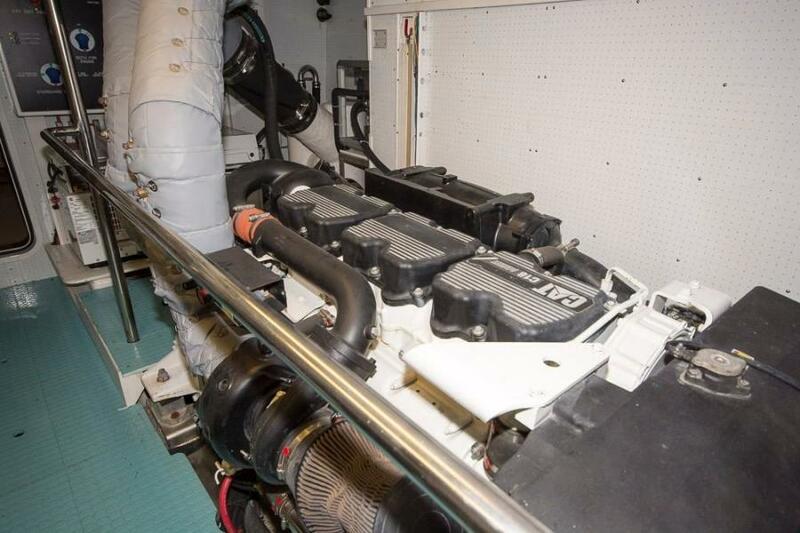 (2) "Racor" 75/1000 Max Dual Fuel Filters For Main Engines. (1) "Racor" 1000ma Single Fuel Filters For Generators. 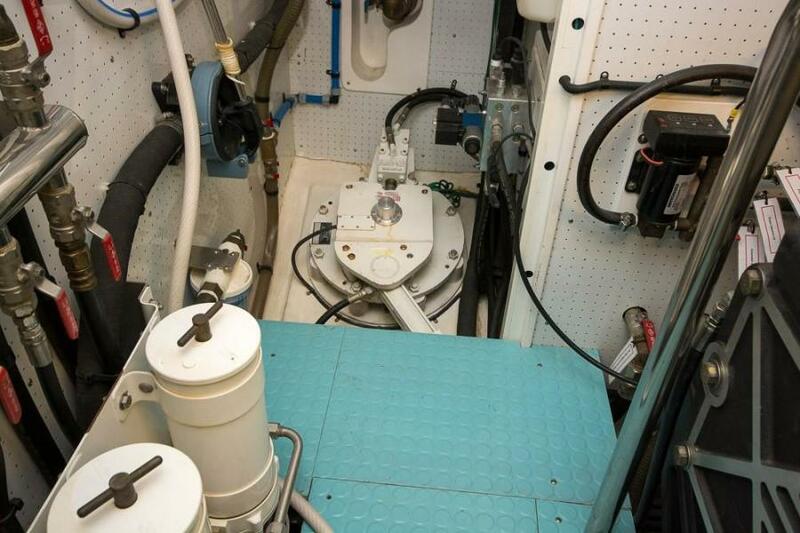 "Teleflex" Hydraulic Steering System For Dual Stations. One (1) Oil Change Pump For Engines And Generators. Ball-Valve Bronze Seacocks On All Through-Hulls Below Waterline. 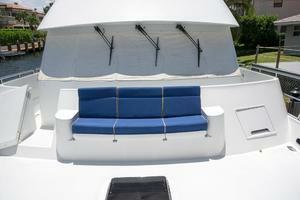 Copper Bonding System to all Underwater Fittings with Zink Anodes. 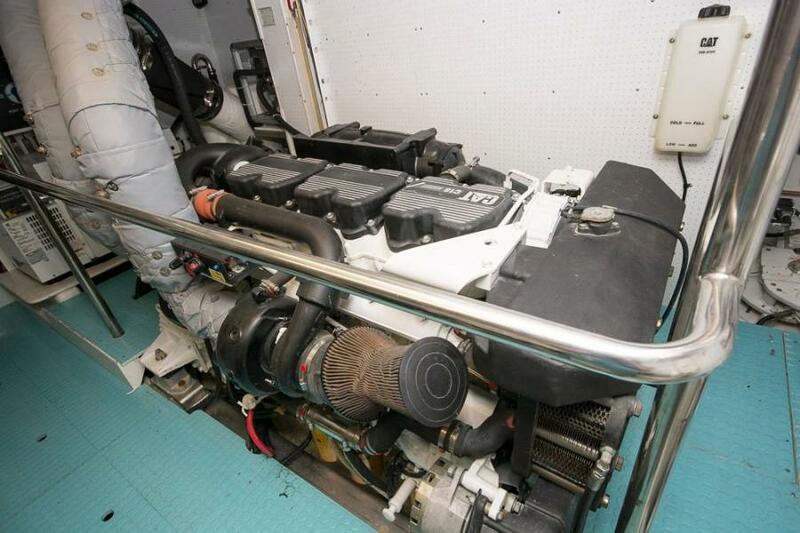 Four (4) Automatic 24vdc Bilge Pumps And Emergency Bilge Suction On Engine. Two Automatic 24vdc Shower Pumps. 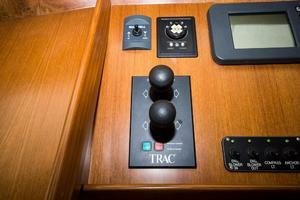 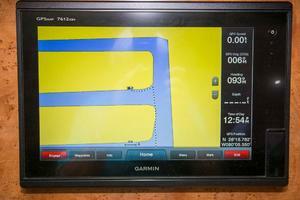 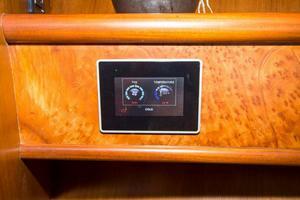 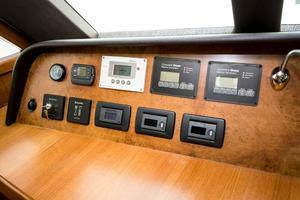 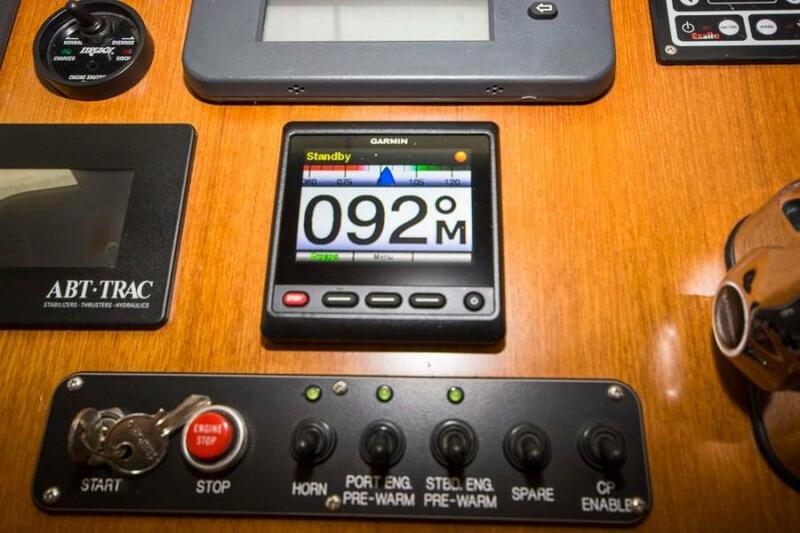 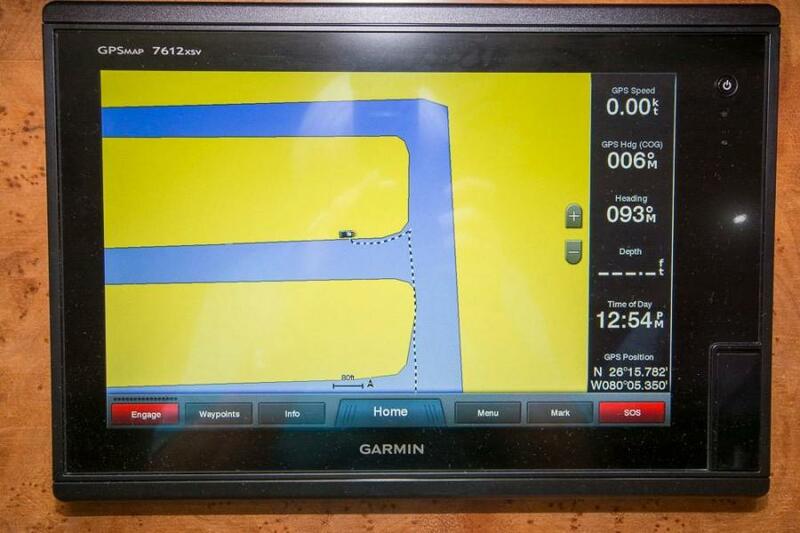 High Bilge Water Alarm System With Warning Panel At Pilothouse. 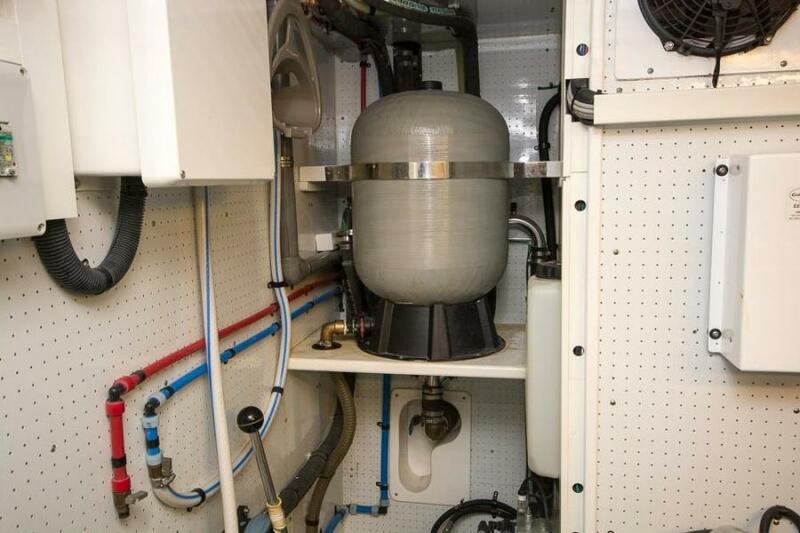 One (1) Stainless Steel Water Tank (Capacity: 600 Gallons). 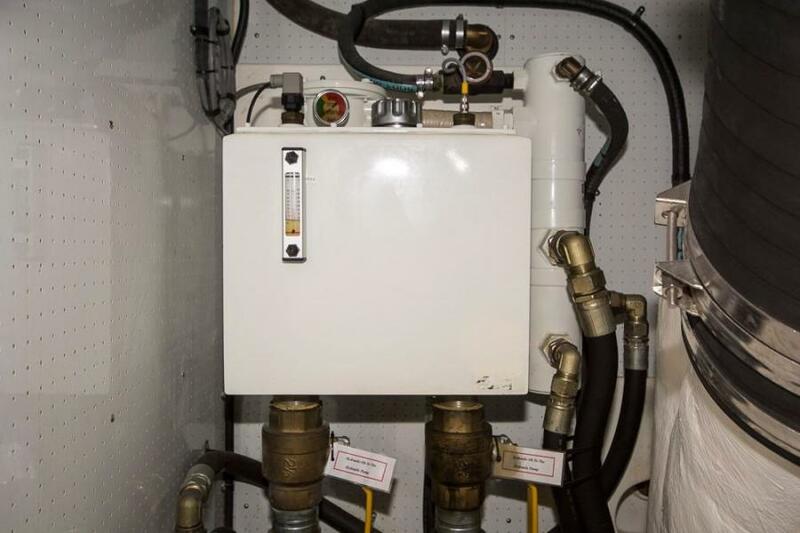 One (1) 24 Vdc Fresh Water Pump W/Accumulator Tank. 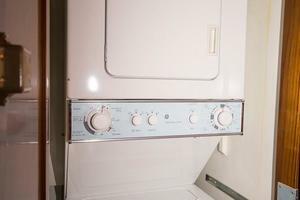 One (1) 115vac 18 Gallons Water Heater W/Heat Exchanger. 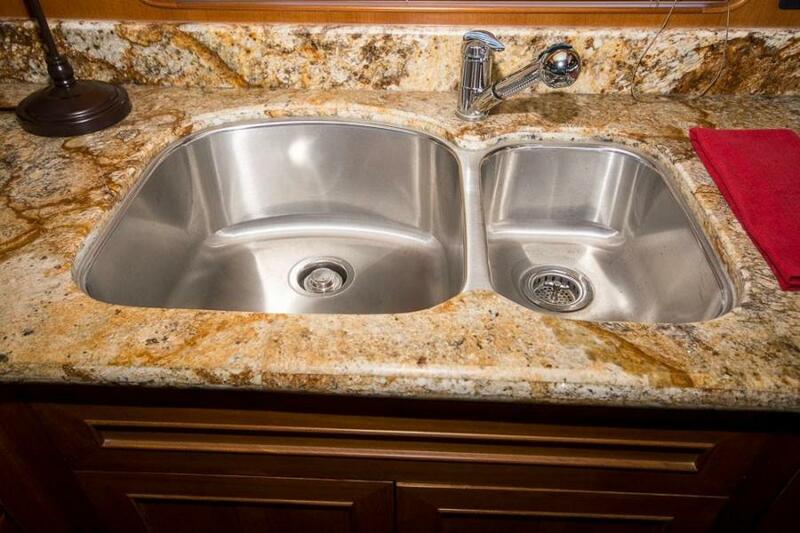 Single Level Mixing Taps For Sinks At Galley Head And Shower. 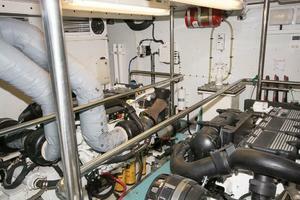 Fresh Water Faucet In Engine Room. One (1) Shore Water Inlet On Transom. 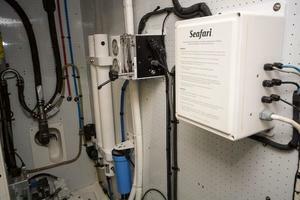 Five (5) "Sealand" Or Tecma Silence Plus Vacuum Flush Marine Toilets With Y-Valves And Sanitary Hose For All Discharge Plumbing. 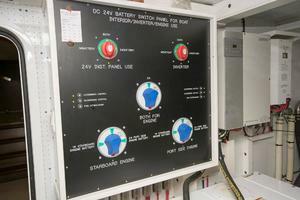 Three (3) Aluminum Fuel Tanks of Total Capacity 1900 Gallons. 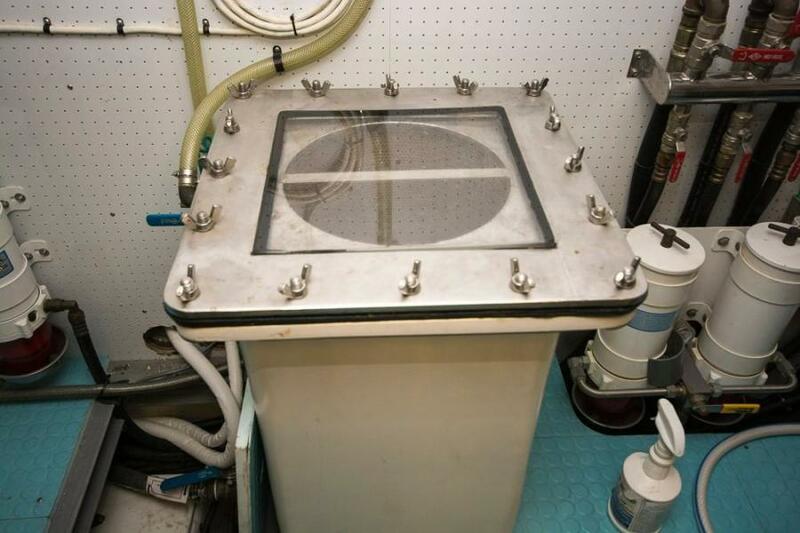 Tank Gauge For Fuel And Water Tanks. 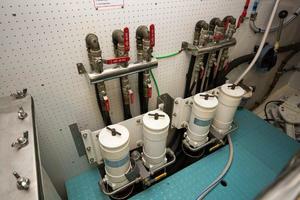 Stainless Steel Fuel Manifold System (Supply & Return). 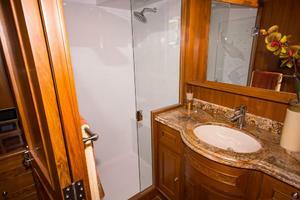 Hot & Cold Transom Shower In Recessed Box. 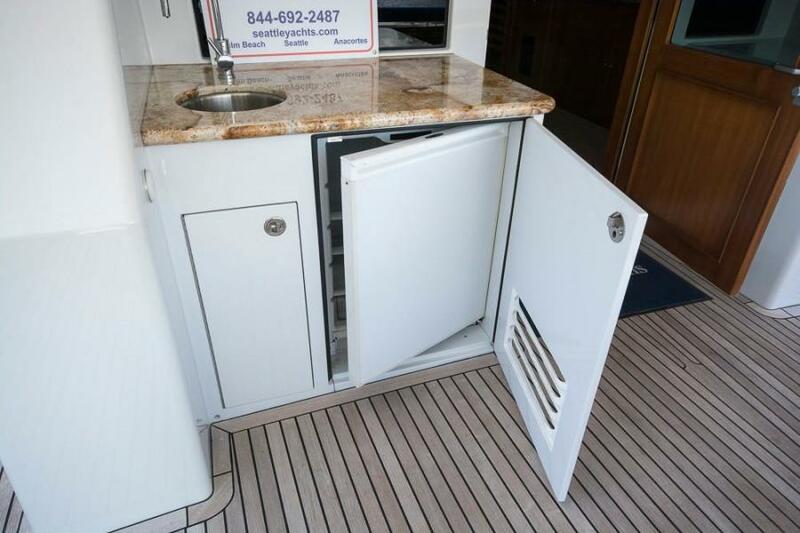 Fresh Water Washdown Outlet On Fore Deck. 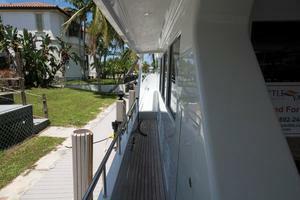 Aft Deck And F/B. One (1) Salt Water Washdown Pump W/Outlet On Foredeck. 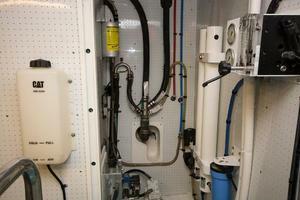 Rigid Fresh Water Pipes And Color Cord Fuel Lines. 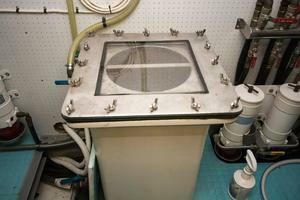 Cleanout And Sight Gauge For Tanks. Headhunter 24v DC Fresh Water Pump with Accumulator Tank. Two (2) 24v DC Automatic Shower Sump Systems with External Pump. 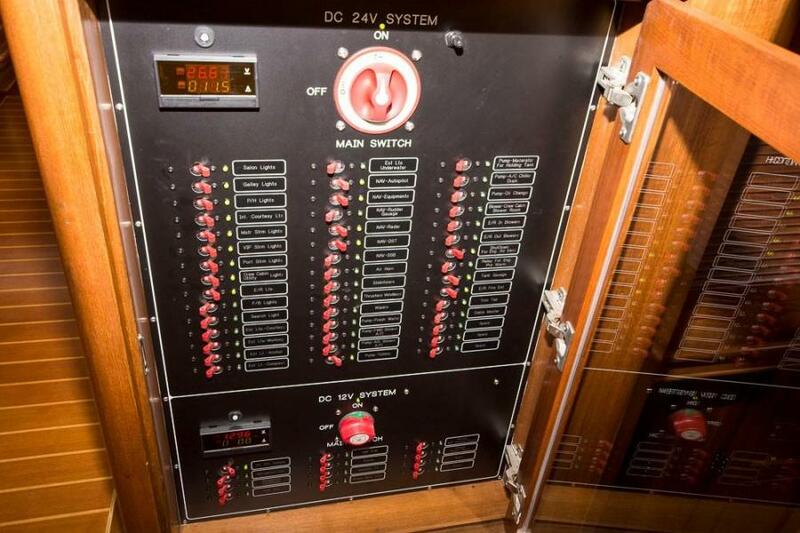 Main Electric Distribution Panel With Gauges And Circuit Breakers For 230/115 Vac And 24/12 Vdc System. 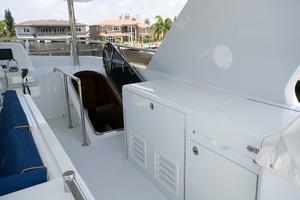 (2) 50 Amp Shore Power Inlet On Transom. 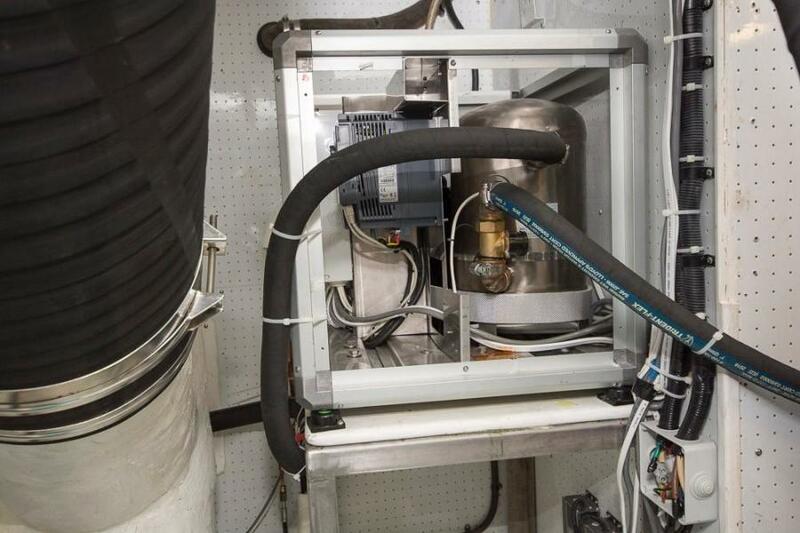 Two (2) 12 Kva Isolation Transformers. Batteries In Frp Boxes: Two (2) Engine Banks W/Two (2) 8d-204ah Batteries For Each Bank. 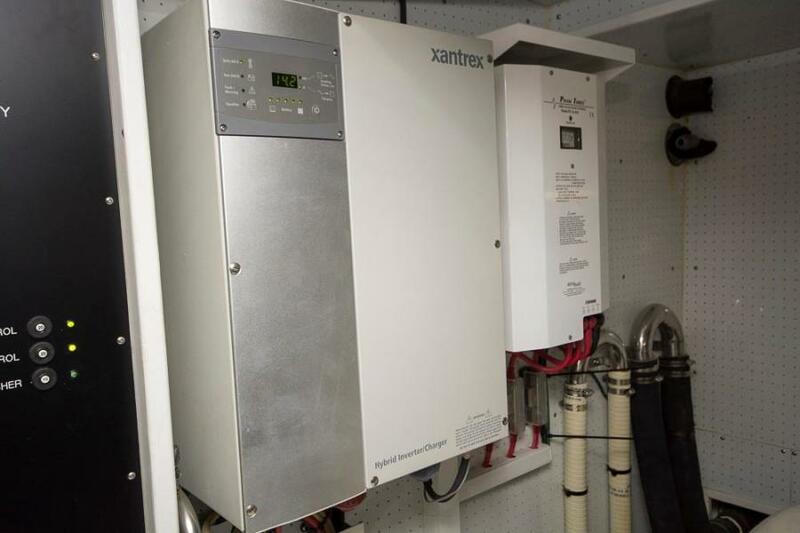 Two (2) House Banks W/Two (2) 8d-204ah Batteries For Each Bank. One (1) Generator Banks 30h-105ah Battery. 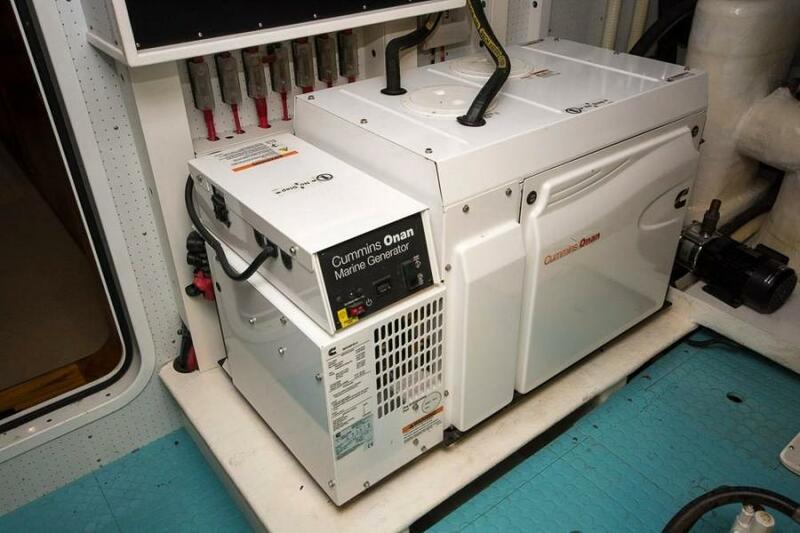 One (1) 24v And One (1) 12v Battery Chargers. 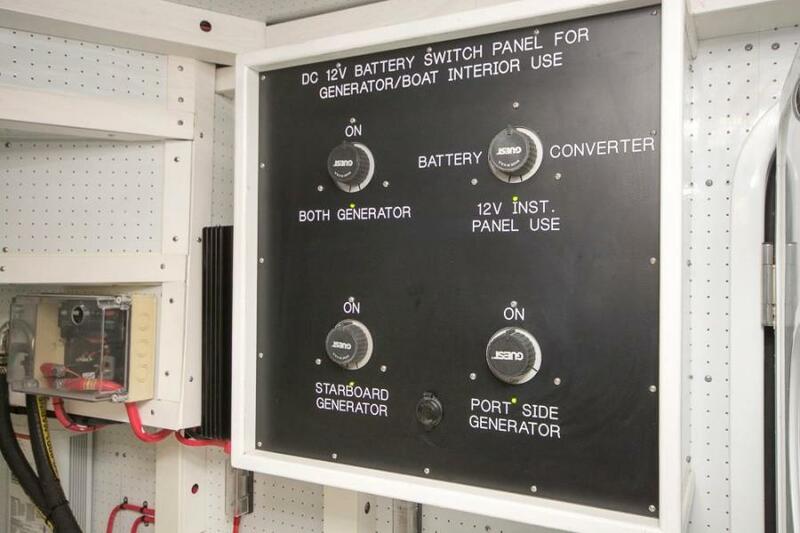 Shoreline Power Transfer Rotary Switches. 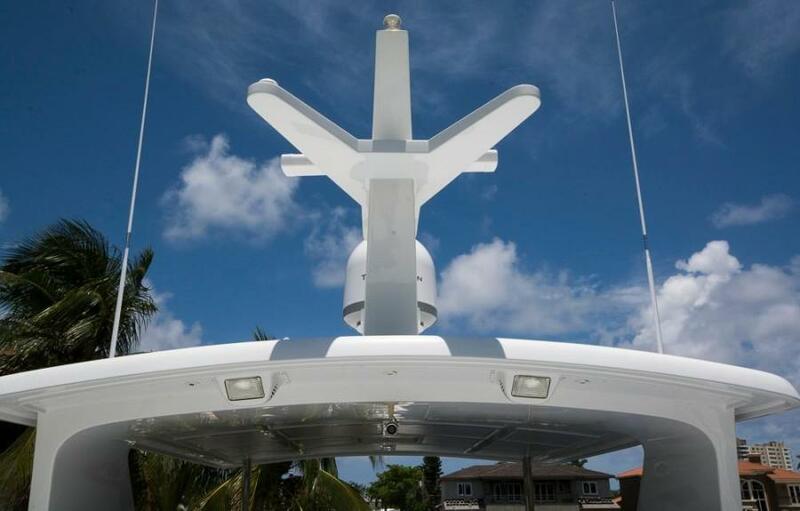 24vdc Overhead Led Light Fixtures Throughout. 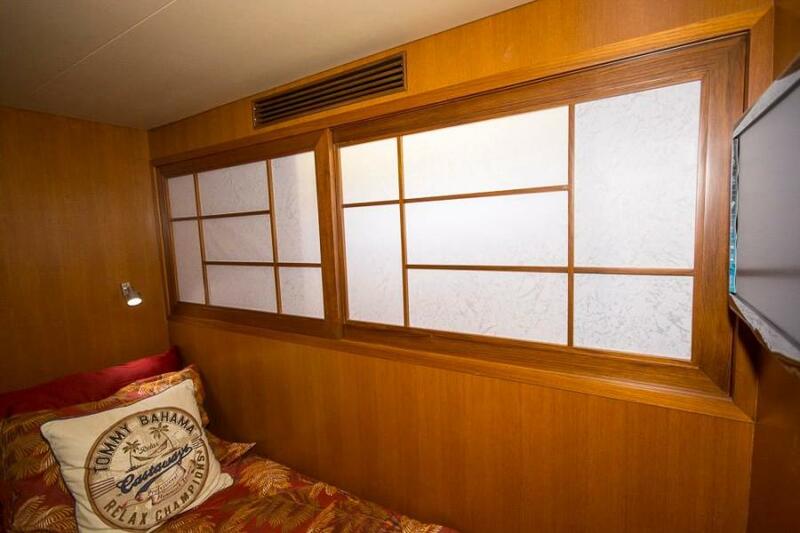 24vdc Rope Style Vallance Lights At Salon And Staterooms. 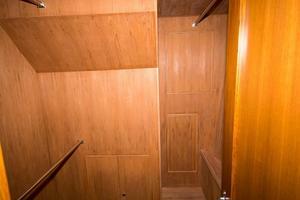 24vdc Step Lights Throughout And Automatic Wardrobe Lights. 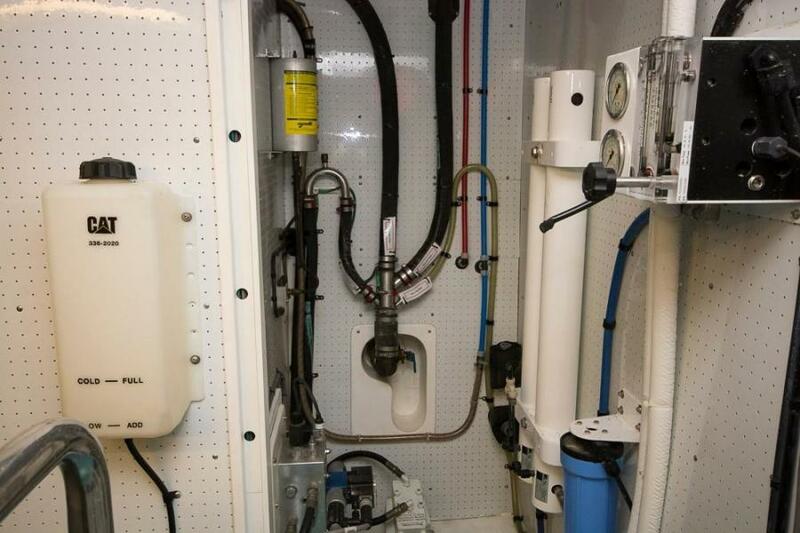 115vac Outlets Throughout. Gfi Outlets For Heads And Exteriors. 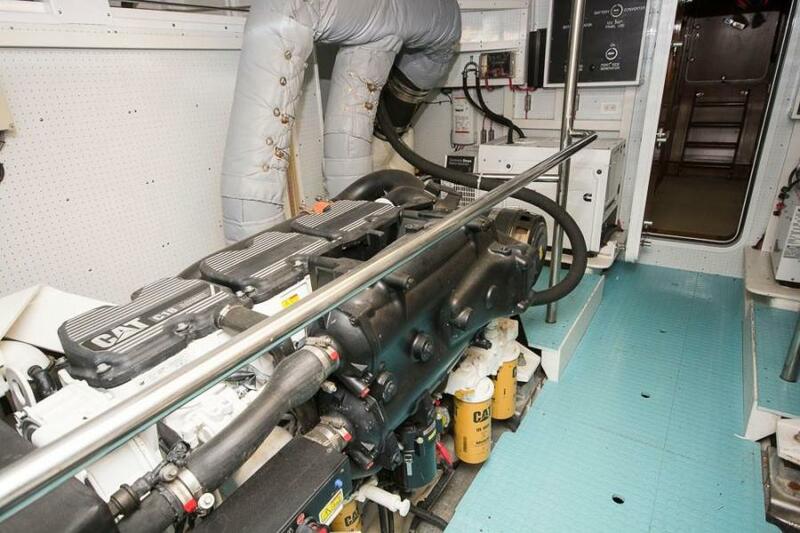 Four (4) Engine Room Blowers and Five (5) Head Vent Blowers. 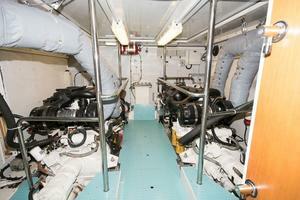 115vac Lights And 24vdc Lights For Engine Room. One (1) 24v Chart Light. 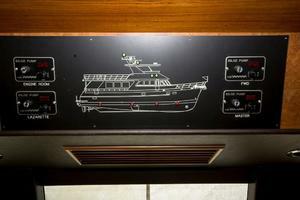 Five (5) "Aqua Singnal "Navigation Lights. 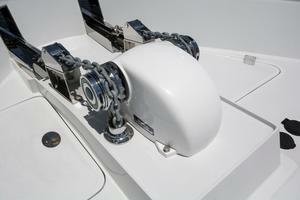 Three (3) Windshield Wipers W/Washdown System. One(1) "Kalenburg" D-Oa Dual -Trumpet Air Horn With Compressor. 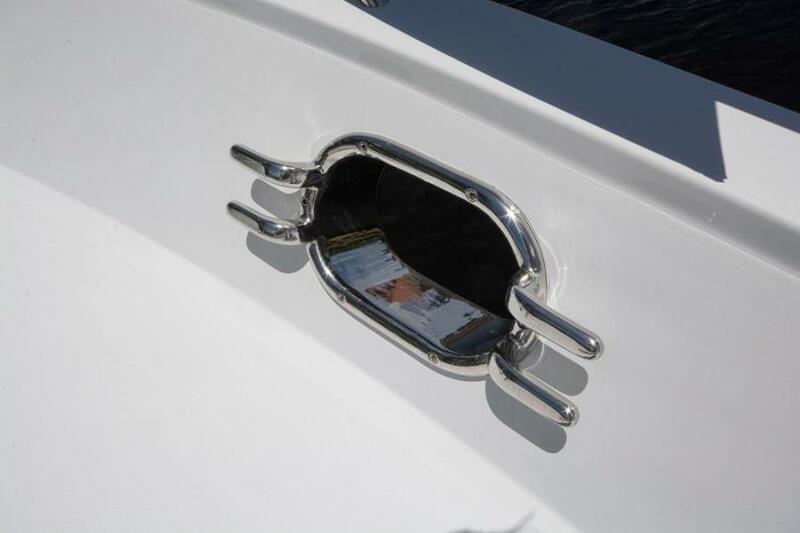 One (1) Tel./Cable Tv Inlet On Transom. 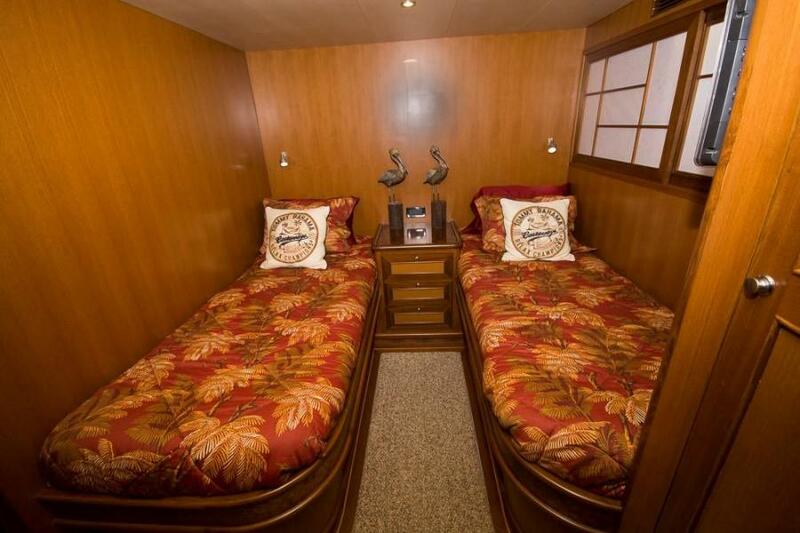 Two (2) "Danforth" 5" Magnatic Compasses. One (1) Dc-Dc Converter (24v To 12v). 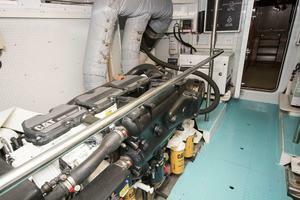 Two (2) Shaft Brushes In Engine Room. 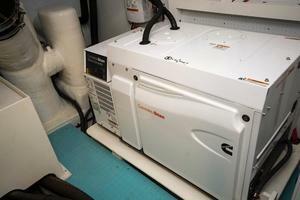 One (1) "Trace" 4kw Inverter (24vdc To 115vac). 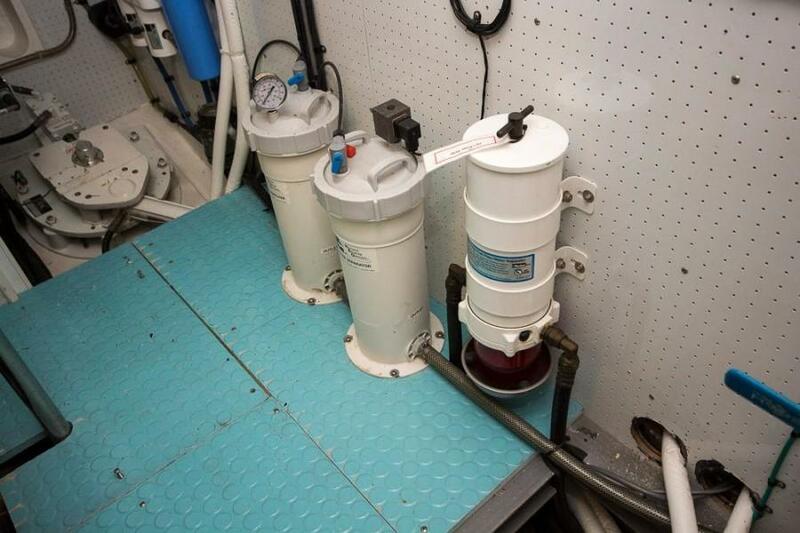 Copper Bonding System To All Underwater Fittings With Zinc Anodes. 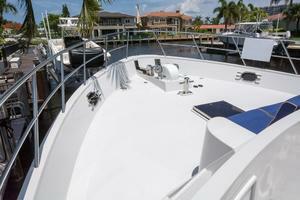 Hull & Deck House: White Color Gelcoat. 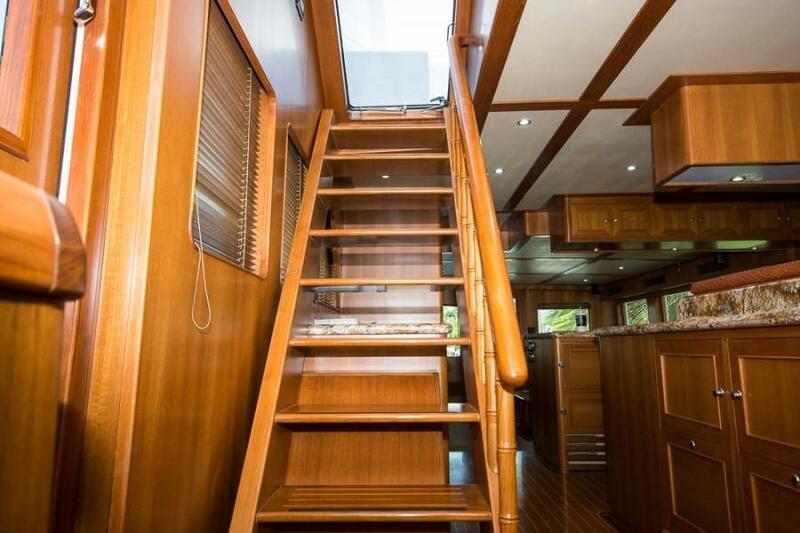 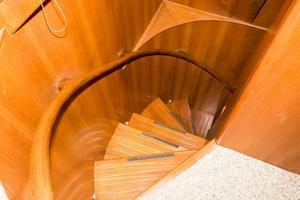 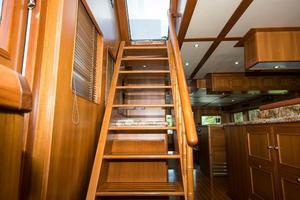 Aft Deck, Flybridge Stairs, Walk-A-Round and Swim Platform all finished in Teak. 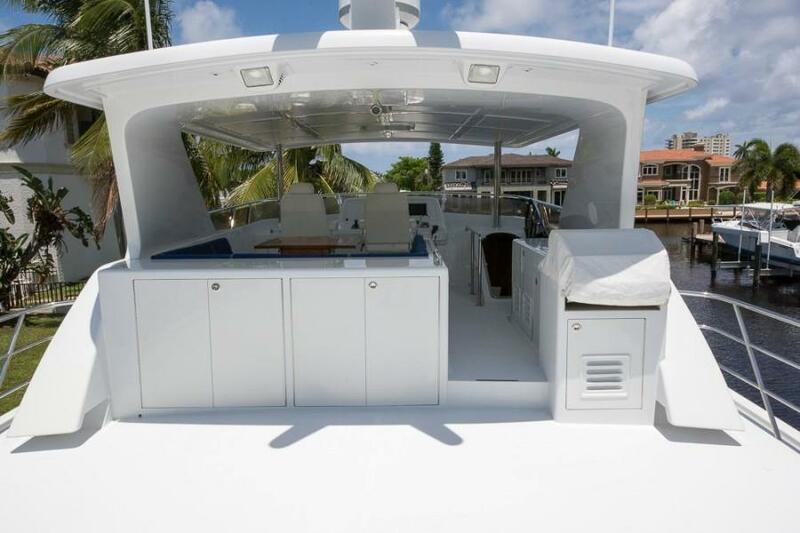 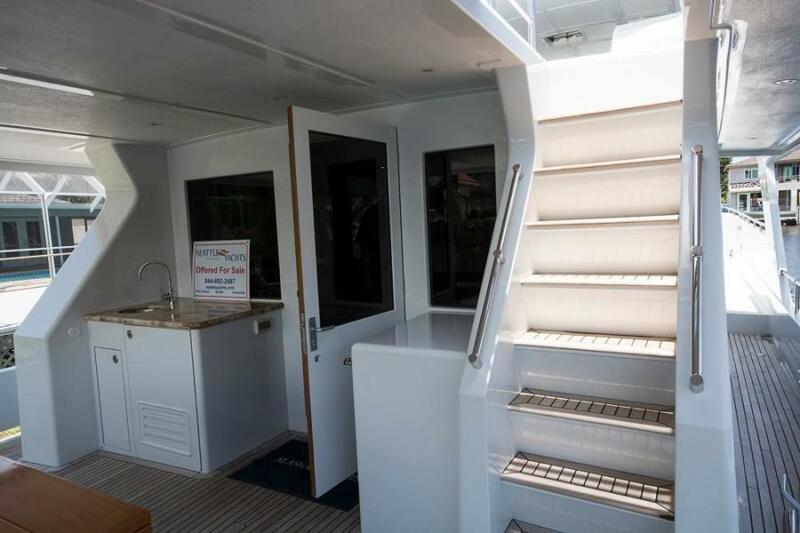 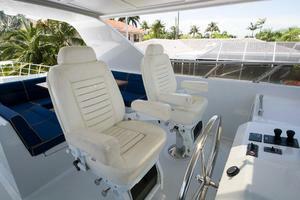 Flybridge Deck White Gelcoat With White Non-Skid. 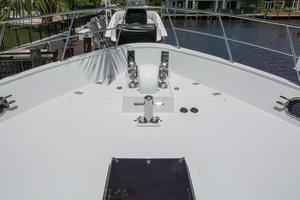 (6) Stainless Steel Hawser Holes W/Cleats. 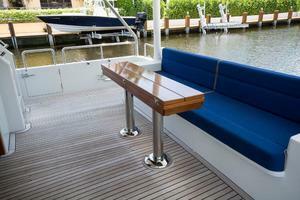 Two Stainless Steel Anchor Chuck/Roller At Bow. 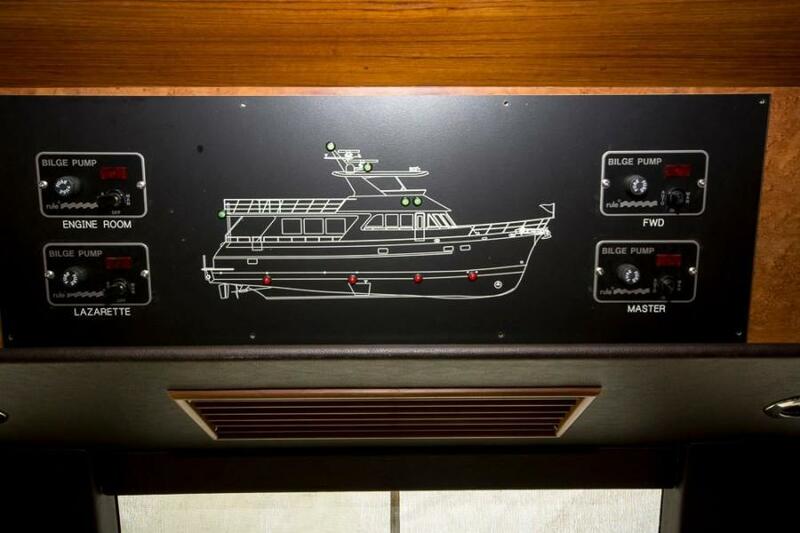 Stainless Steel Framed Plexi-Glass Hatch W/Screen On Fore Deck. 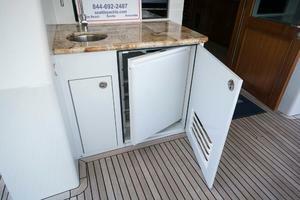 Flush Frp Hatches Over Chain Locker. 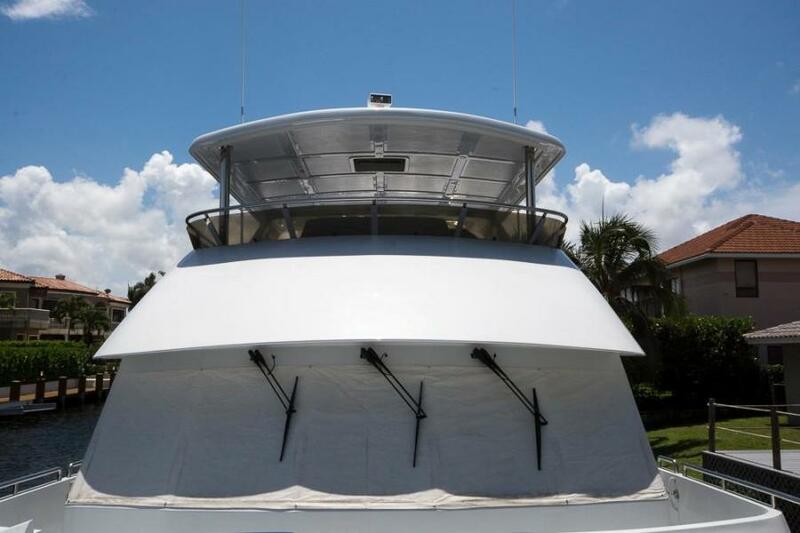 316 Stainless Steel Framed Tempered Glass Portlights With Screens. 316 Stainless Steel Railings On Main Deck. 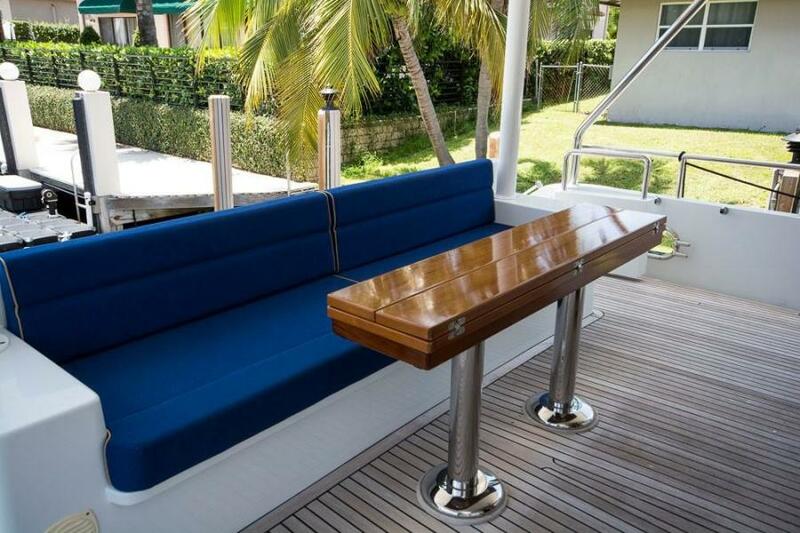 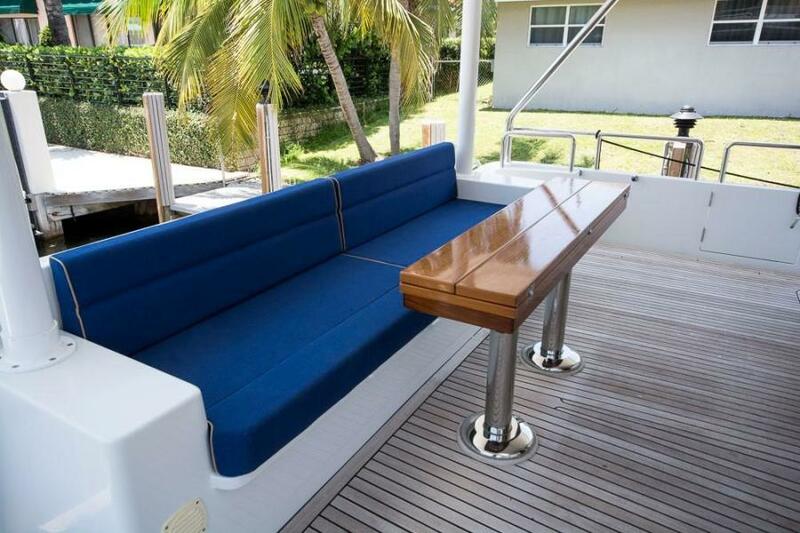 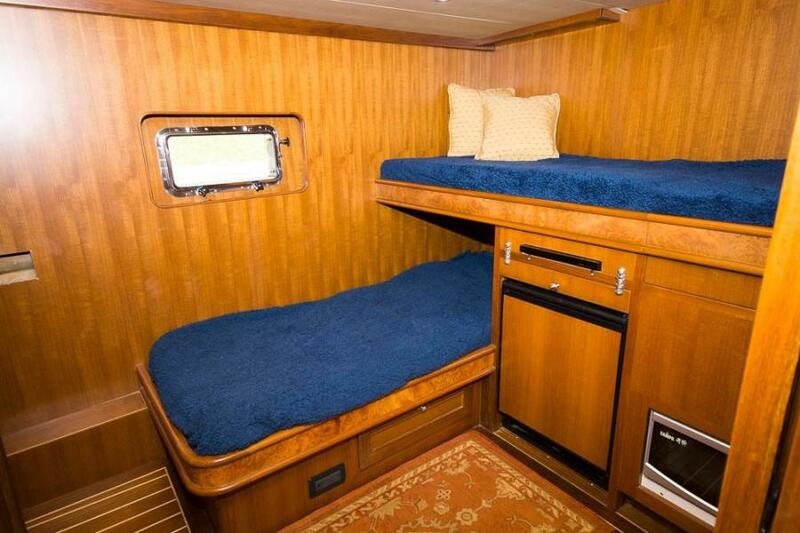 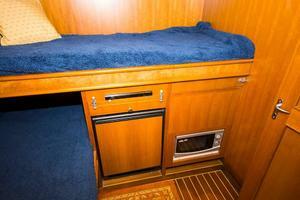 Frp Bench Seats With Storage Beneath On Aft Deck. Two (2) Built-In Stairway To Swimming Plateform. Frp Gate Doors At Fore, Side And Aft Deck. 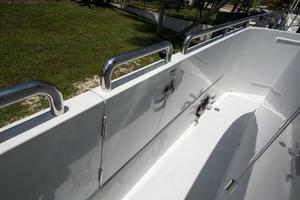 Removable S.S. U-Rails And Swim Ladder On Swim Platform. Water Tight Aluminum Entrance Doors On Both Sides Of Pilothouse. 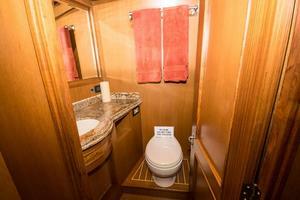 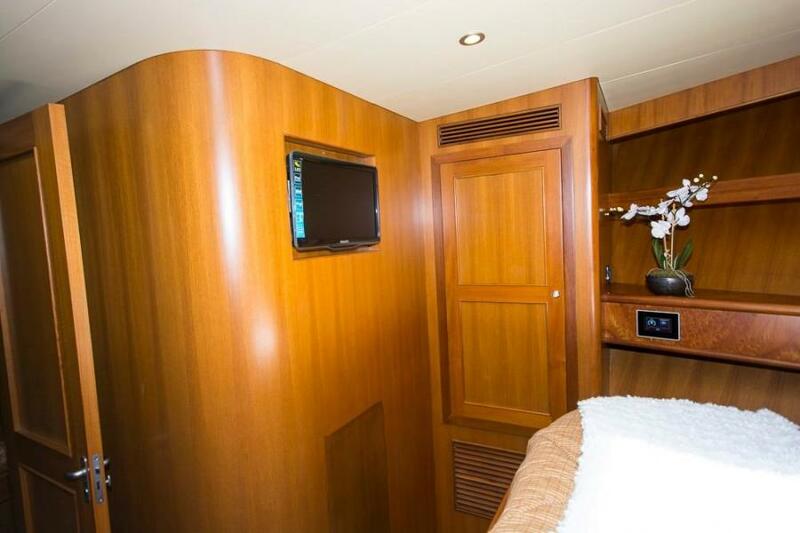 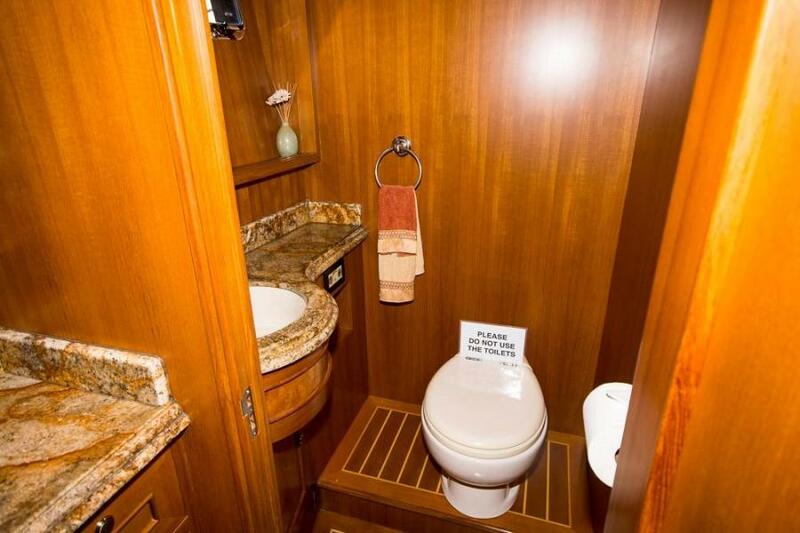 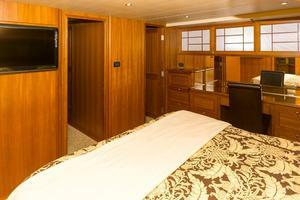 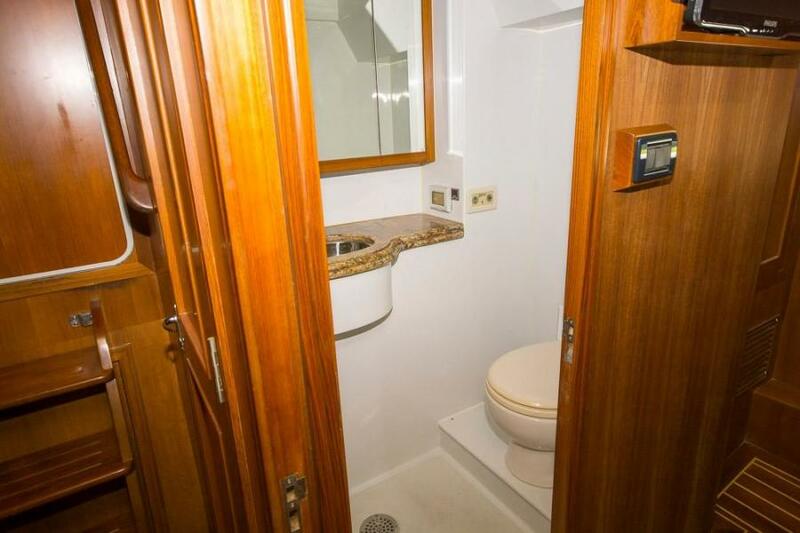 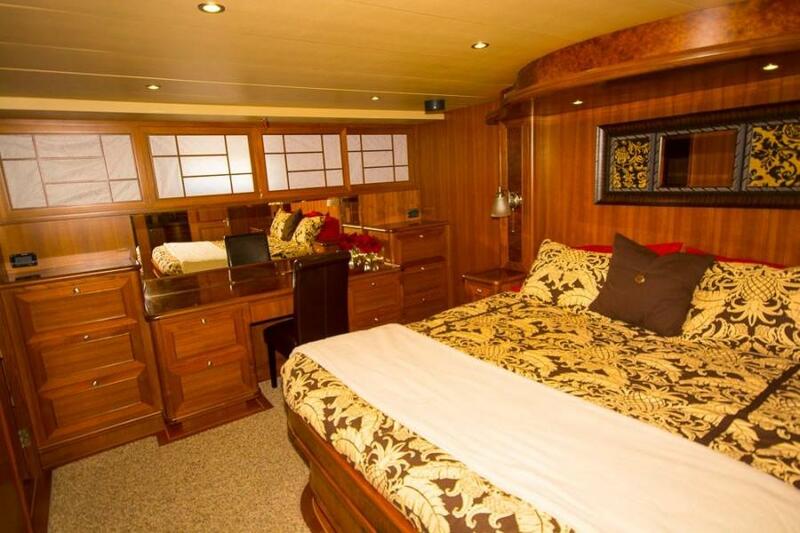 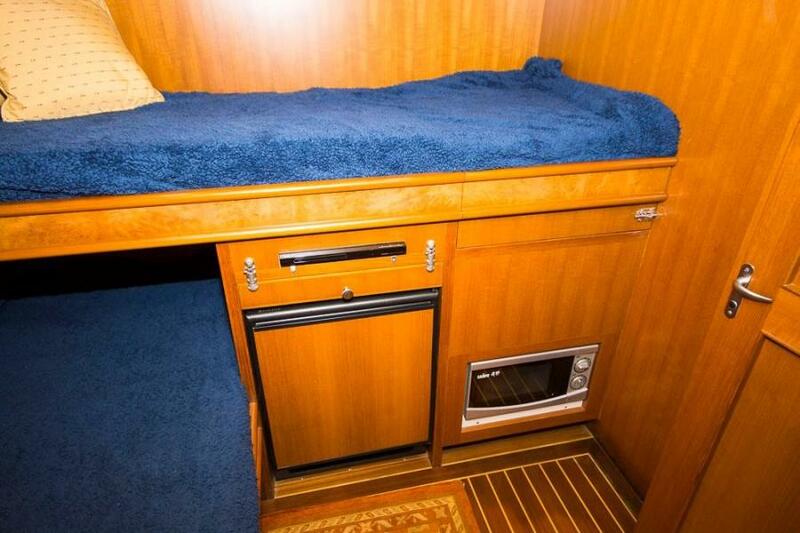 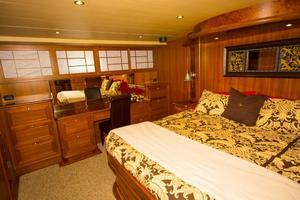 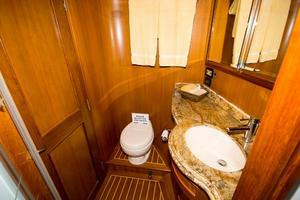 Two Man Crew Quarters With Head, Sea Garage, Three Staterooms All With Ensuite Heads, All Detailed Specs In General Layout Specs. Teak Veneer Panel/Vinyl Coverings On Bulkhead. 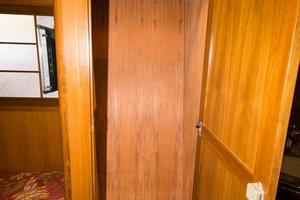 Teak Cabin Doors And Cabinet Doors. 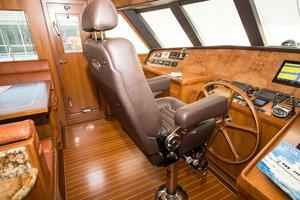 Teak/Holly Cabin Sole At Galley Pilothouse And Heads. 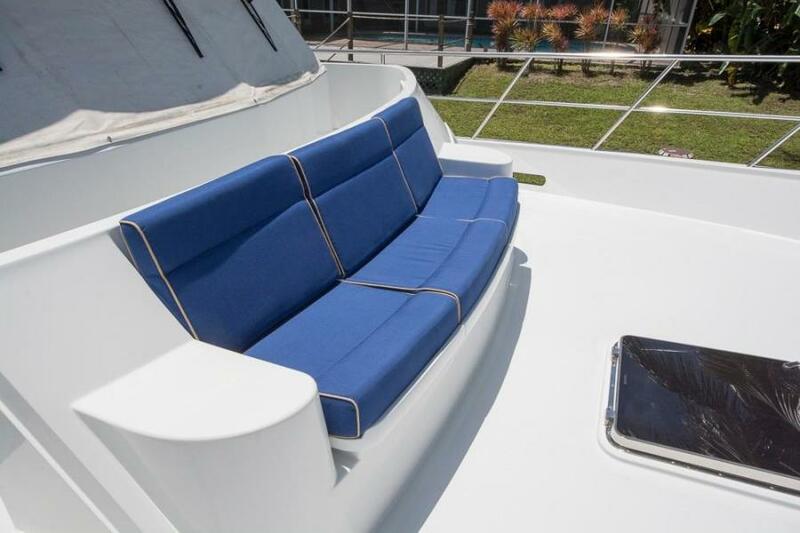 Cushion W/ Buyer Supply Cover Material For Berths And Seats. 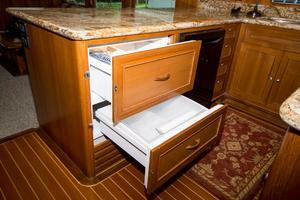 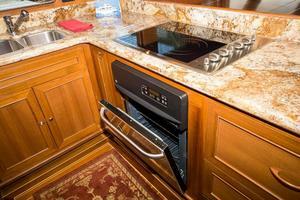 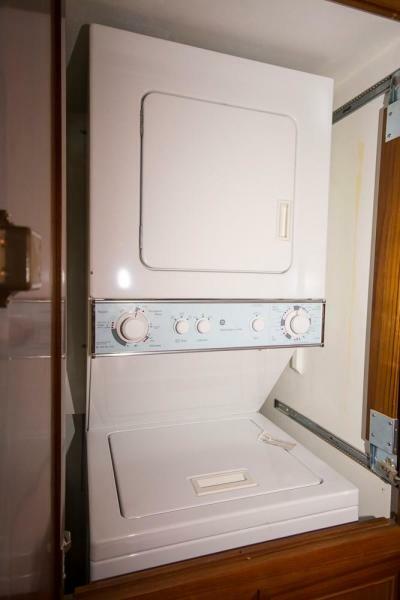 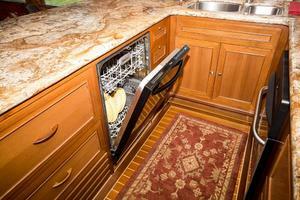 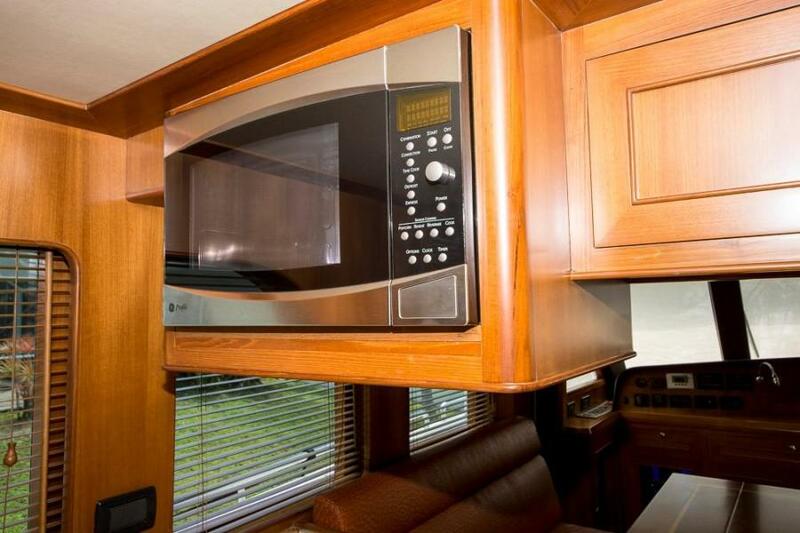 Stainless Steel Undermount Sinks In Galley And All Heads. 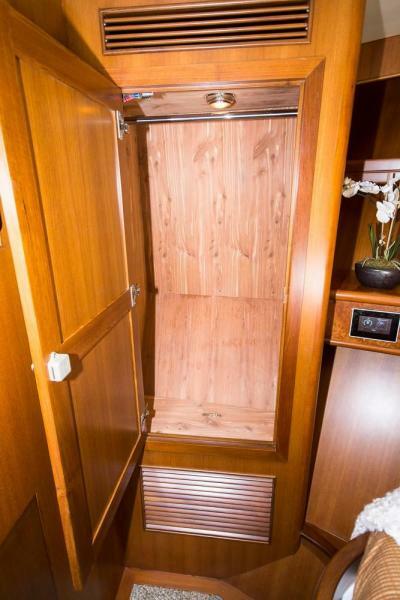 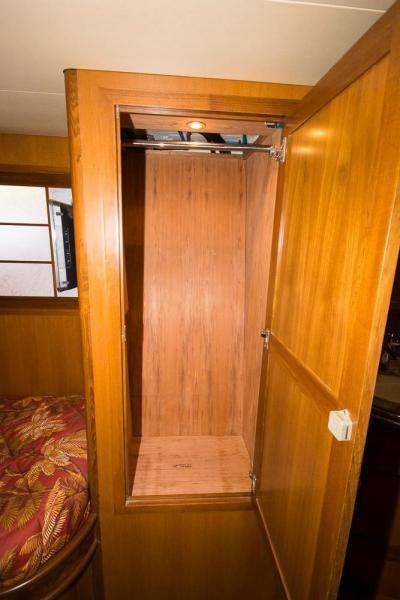 All Closets Are Cedar Lined. 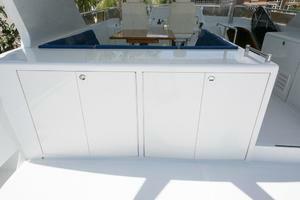 All Drawers Finished Teak With Formica Interiors. 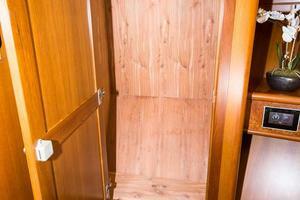 Hanging Lockers With Automatic Lighting. 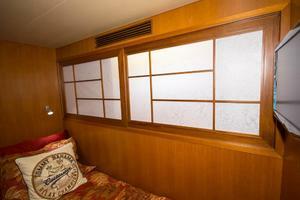 Light Valance In Salon And Staterooms. 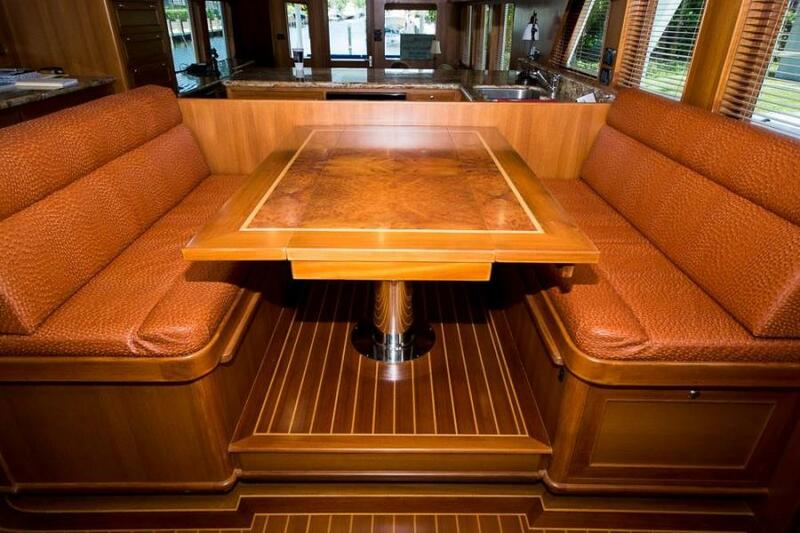 Satin Varnish On Interior Teak. 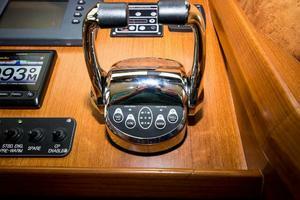 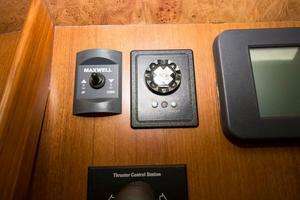 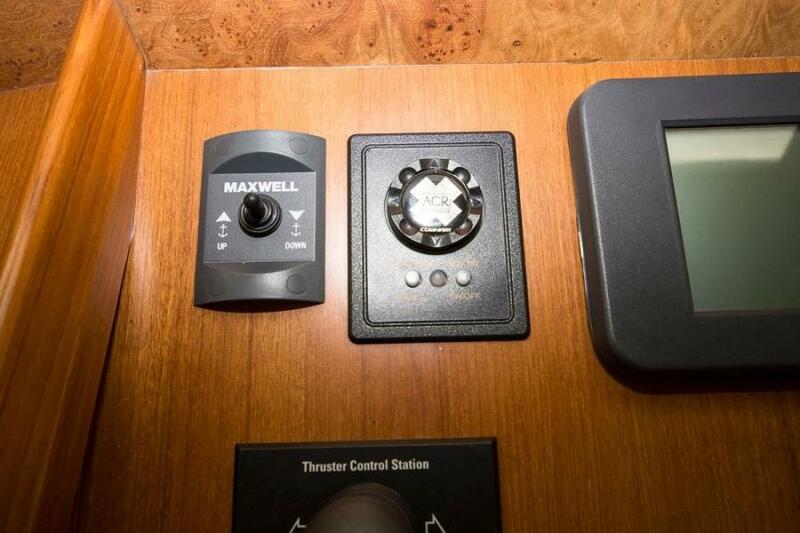 Chrome Reading Lights In Vip, Guest & Crew Staterooms, Model Vip. 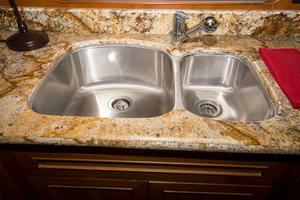 Chrome Faucet In Head Sinks. 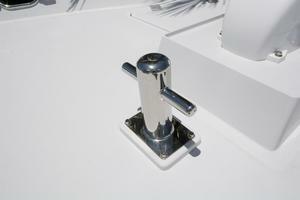 Chrome Hand Shower W/ Shower Bar, Hose & Soap Dish. Cabinets For Refrigerator Wash Basin, Icemaker & Bbq Grill Behind Seats. Venturi Windscreen With Stainless Steel Grab Rails. 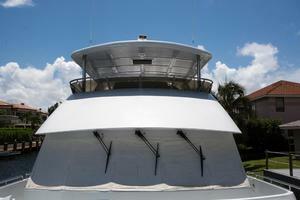 Frp Radar Arch With Two (2) Deck Lights. Opening Hatch And Stairs Down To Pilothouse. 316 Stainless Steel Safety Rails On Flybridge / Boat Deck. 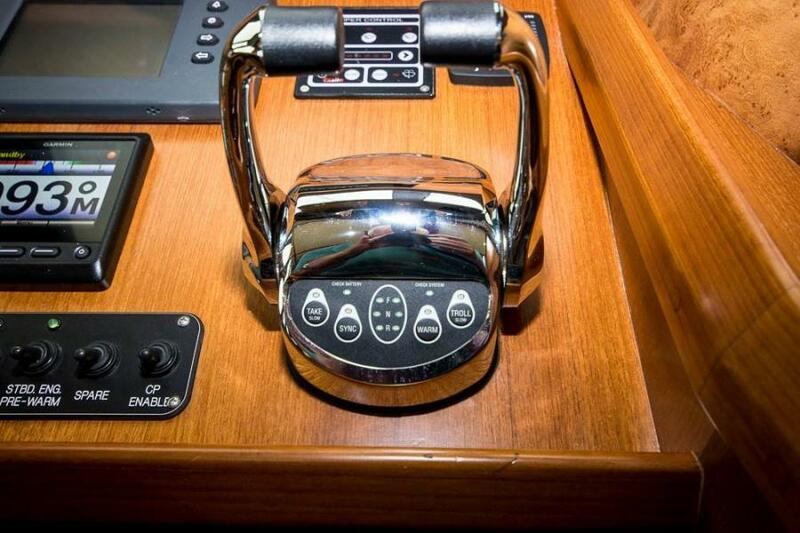 316Stainless Steel Destroyer Steering Wheel. 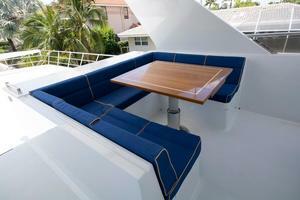 Bench Cushions With Choice Of Color Sunbrella Covered Cushions. Lb Chairs Power Controlled To Adjust Height, Tilt, Forward, Reverse, Length Of Foot Rest. 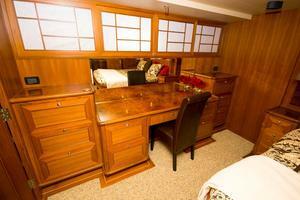 Twelve (12) Safeguard Type 1 Orange Life Vess For Adults Over 90 Lbs.